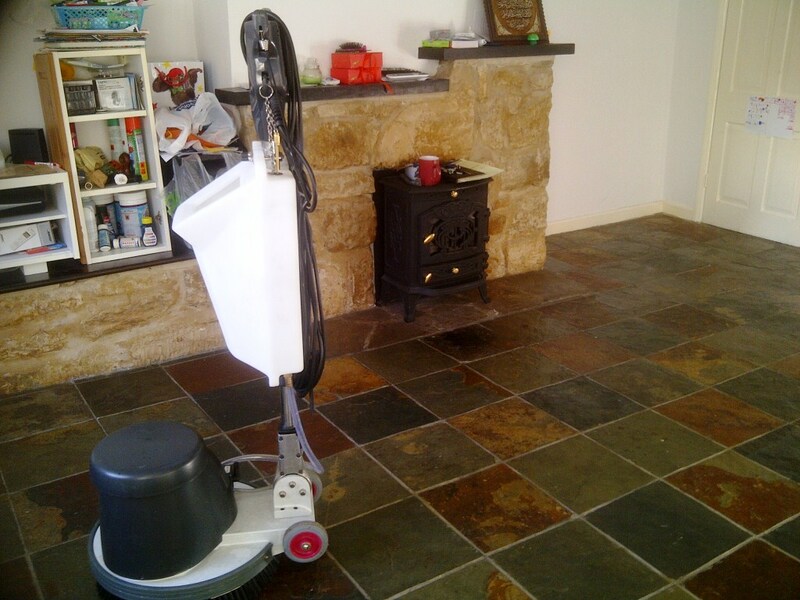 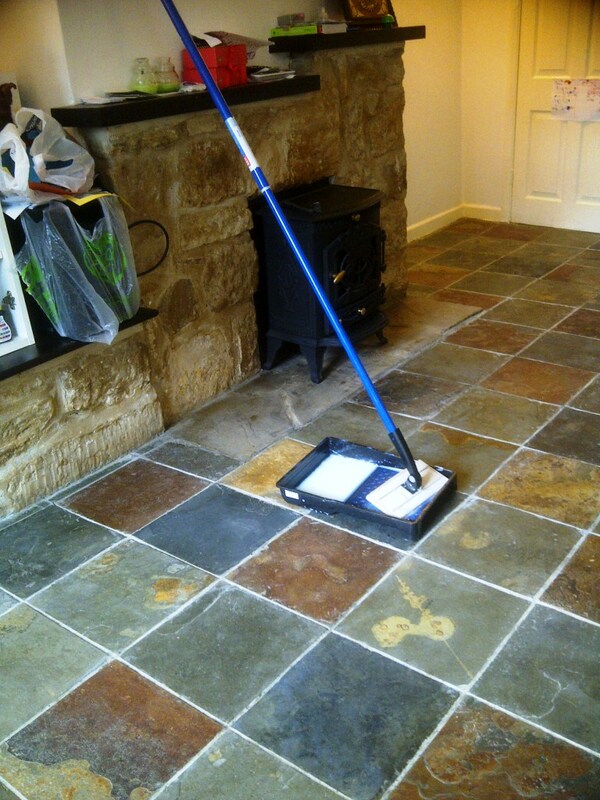 On this page you will find a good selection of photographs taken during the cleaning and sealing of a Chinese Slate tiled floor in the village of Kingsthorpe, Northampton. 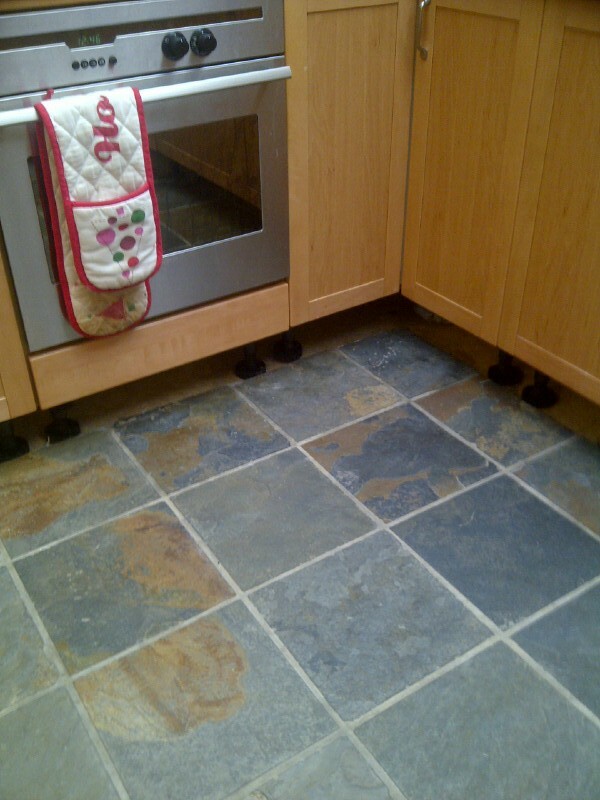 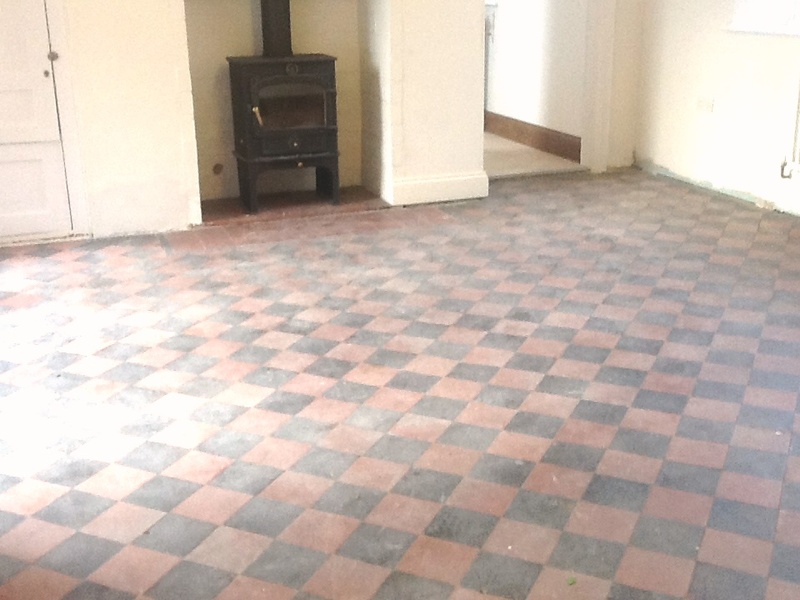 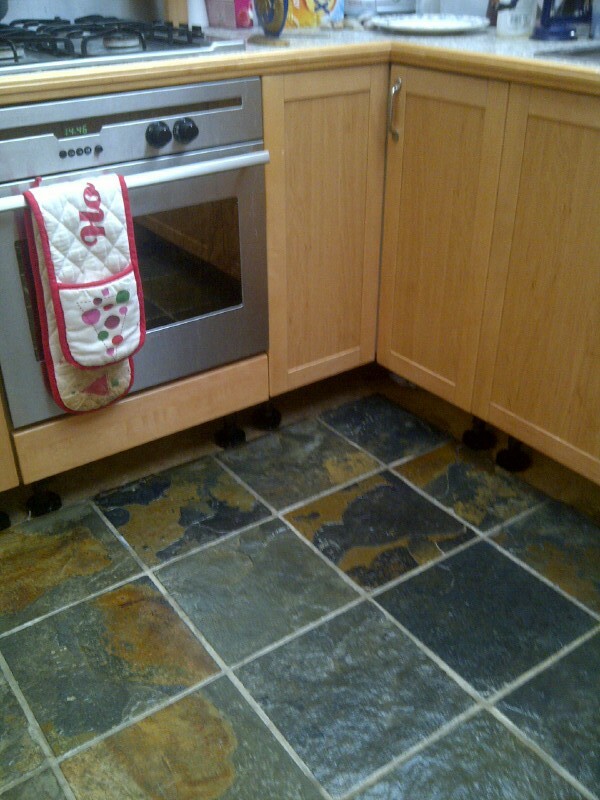 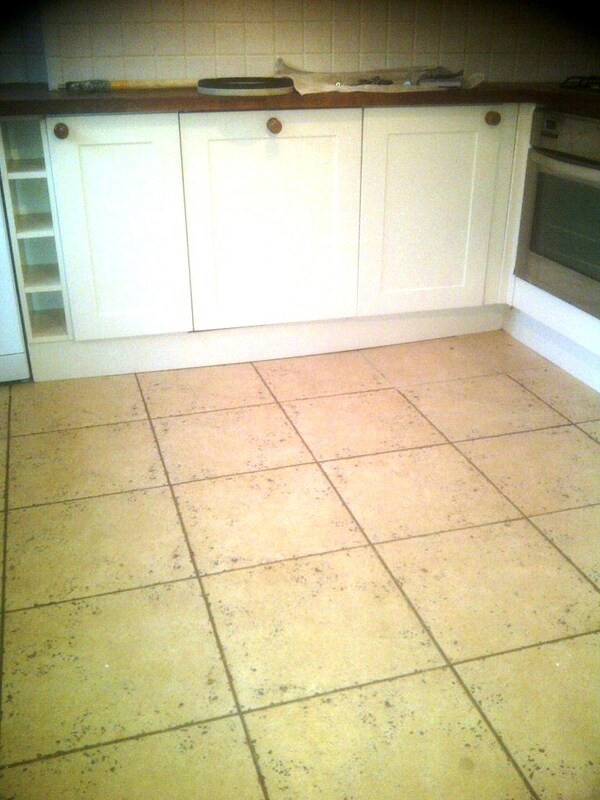 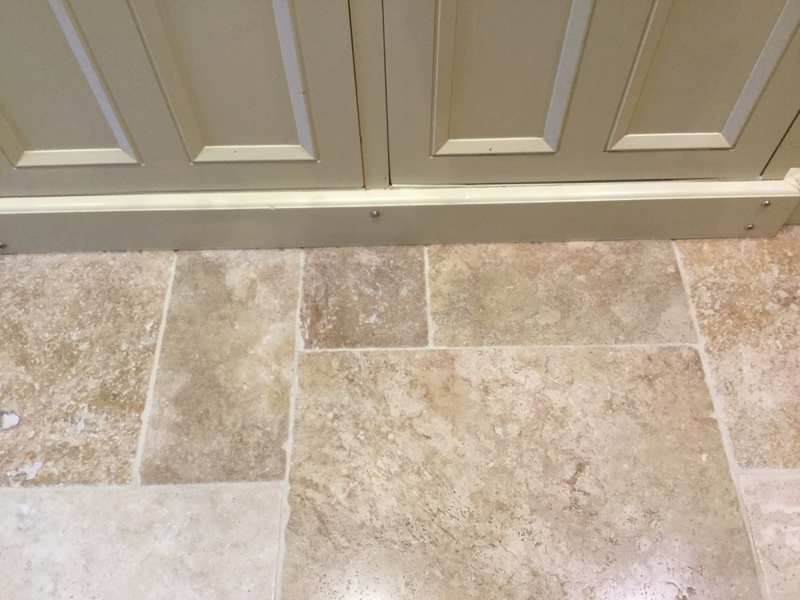 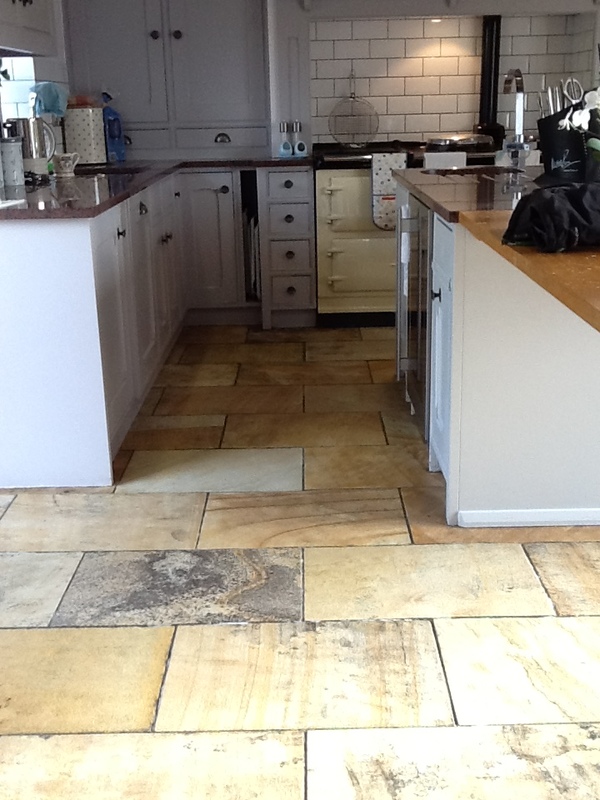 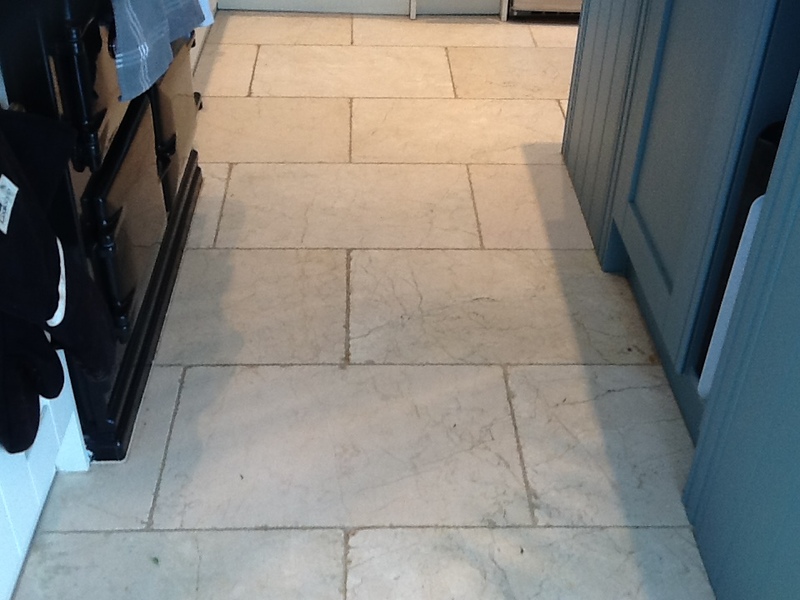 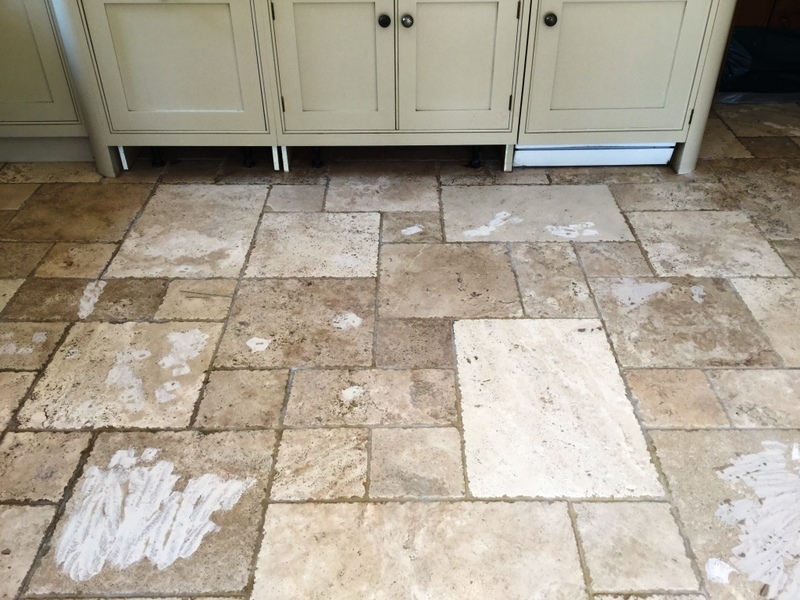 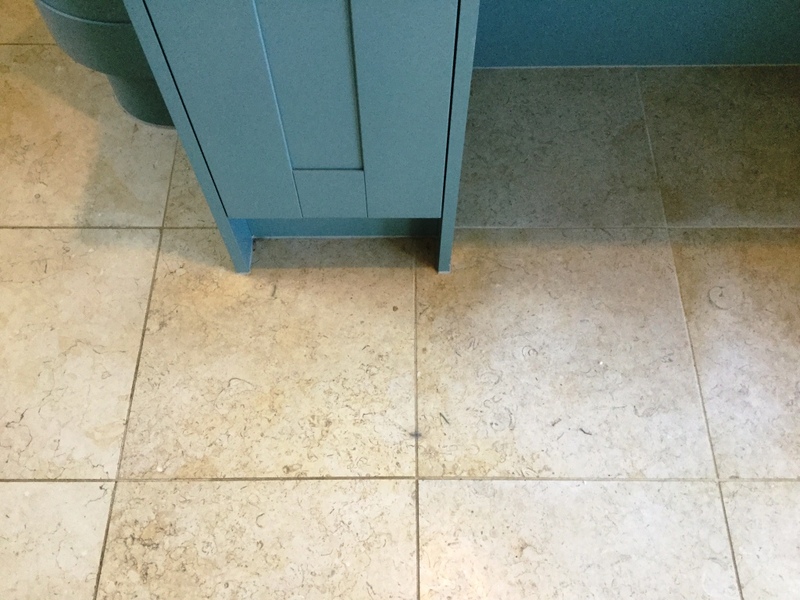 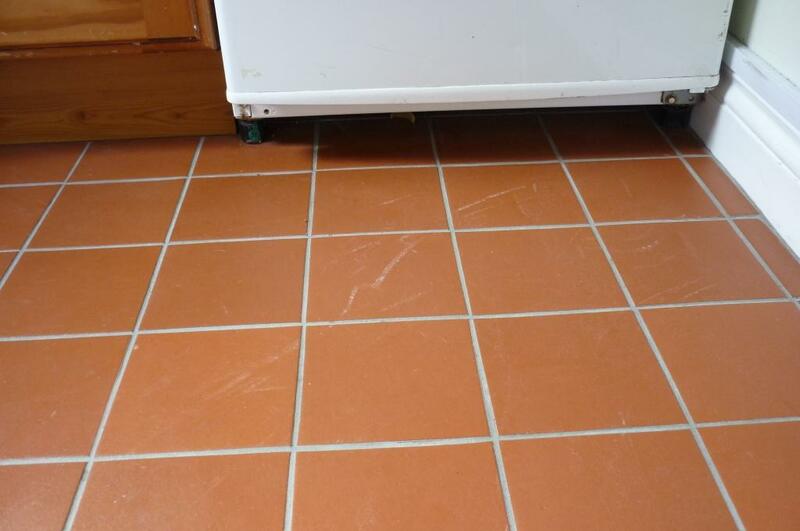 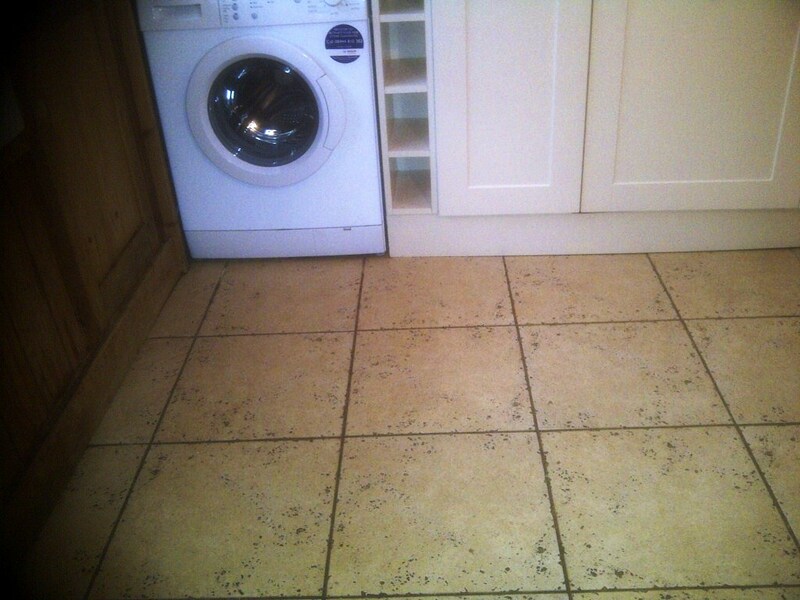 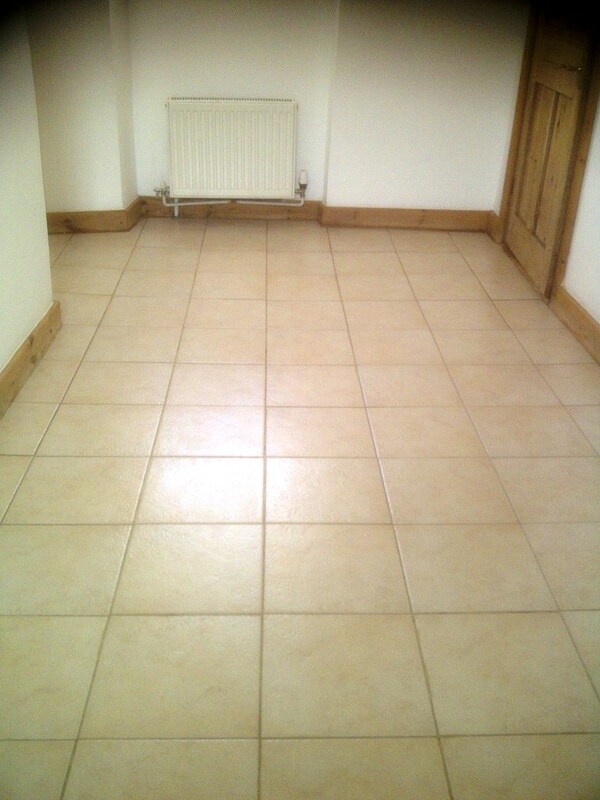 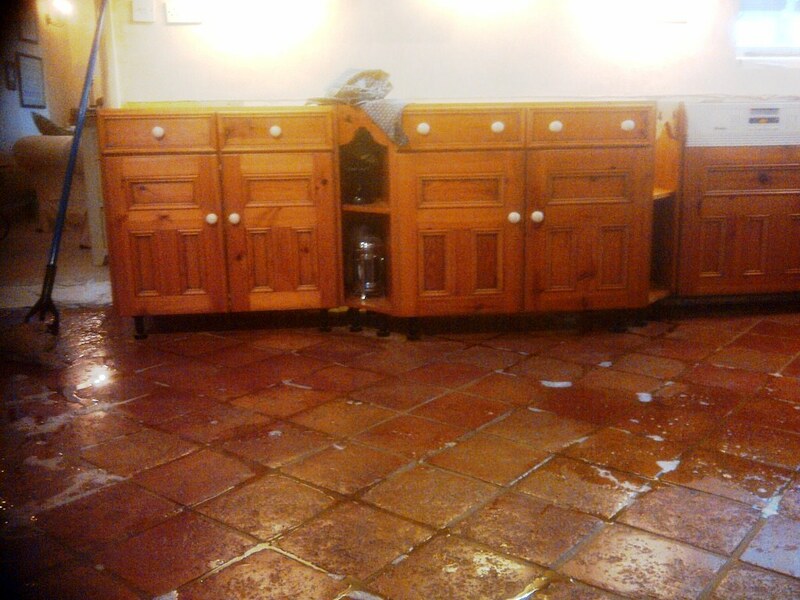 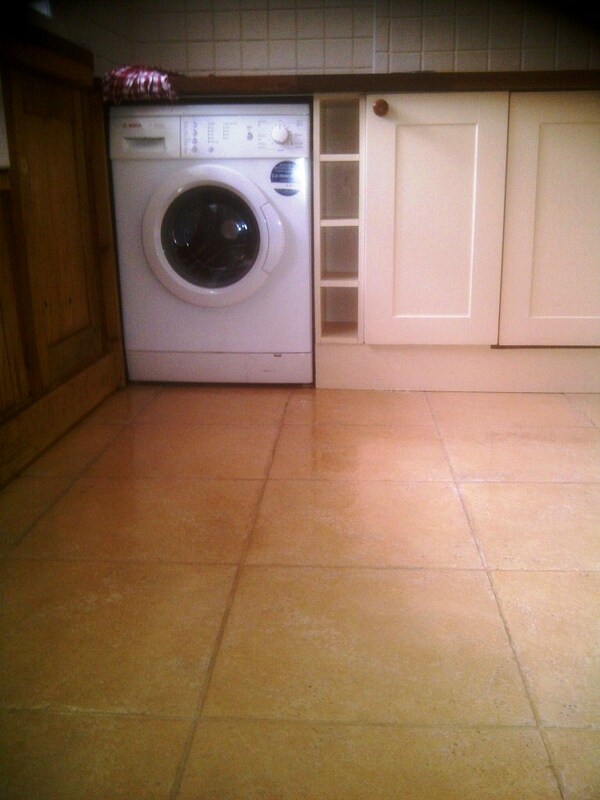 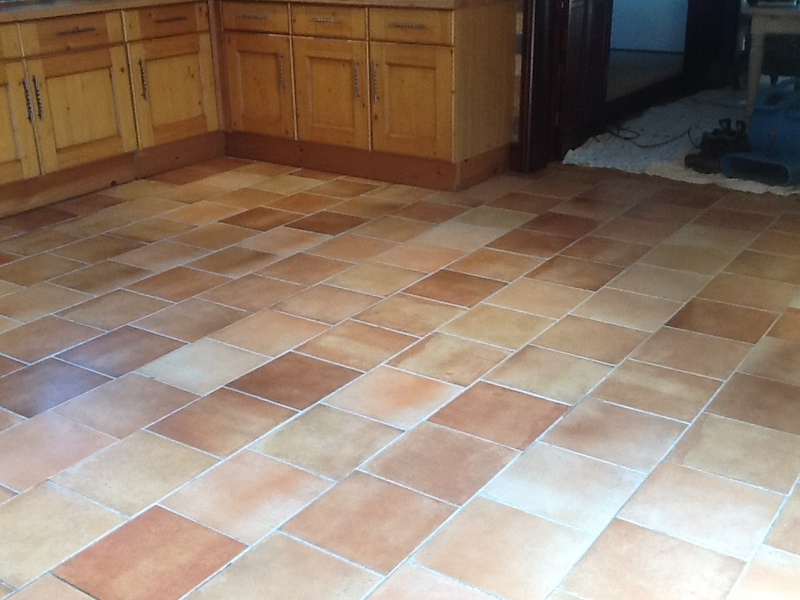 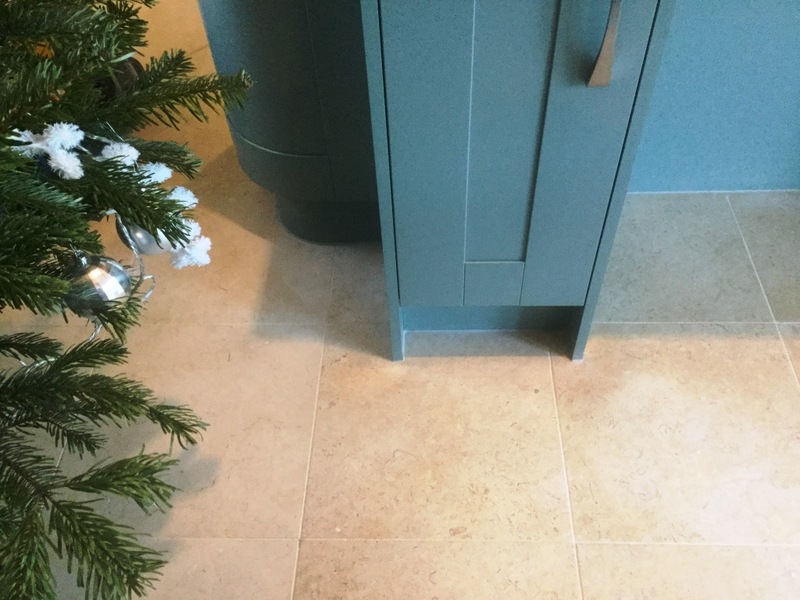 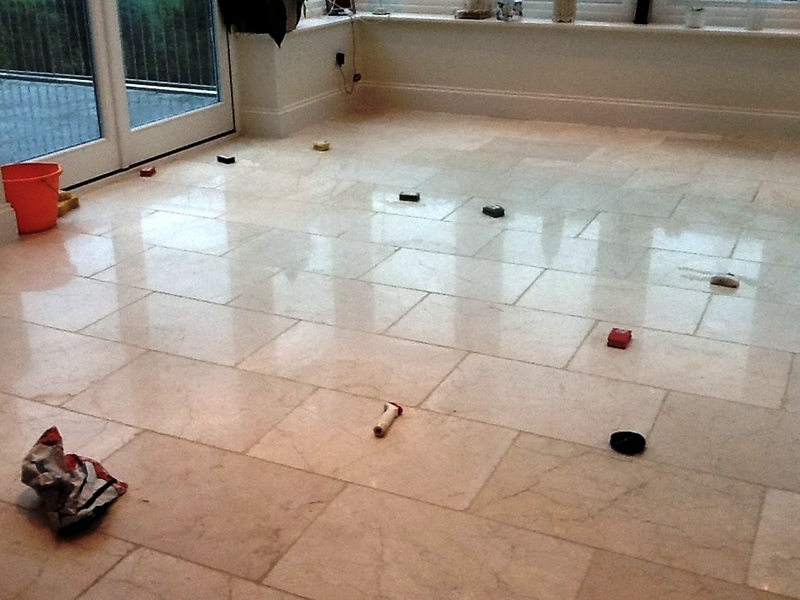 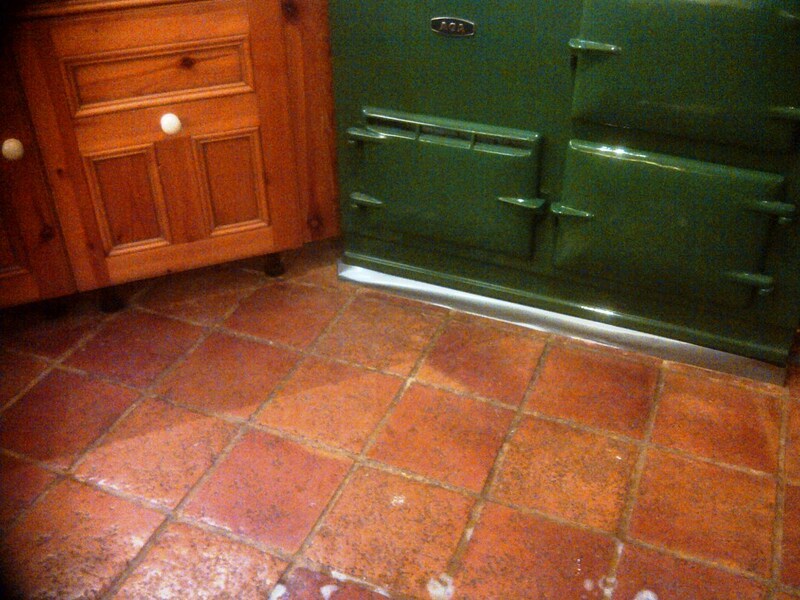 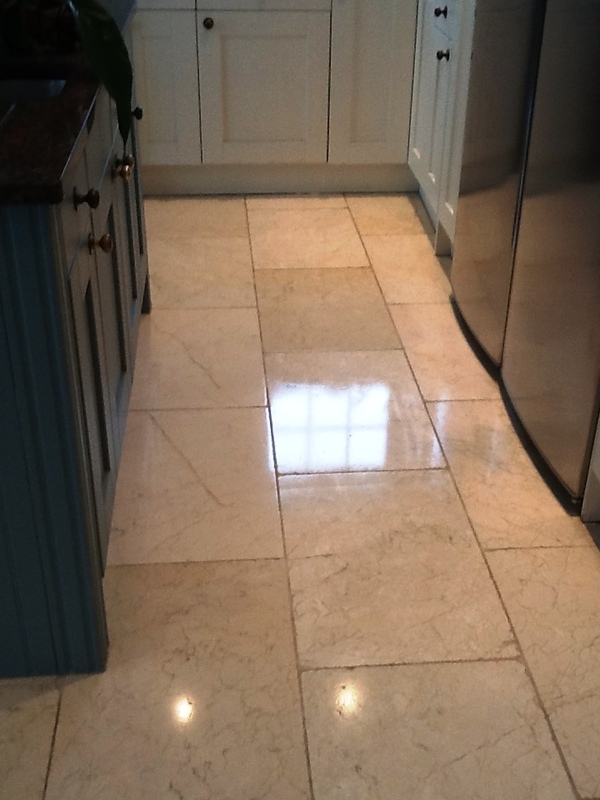 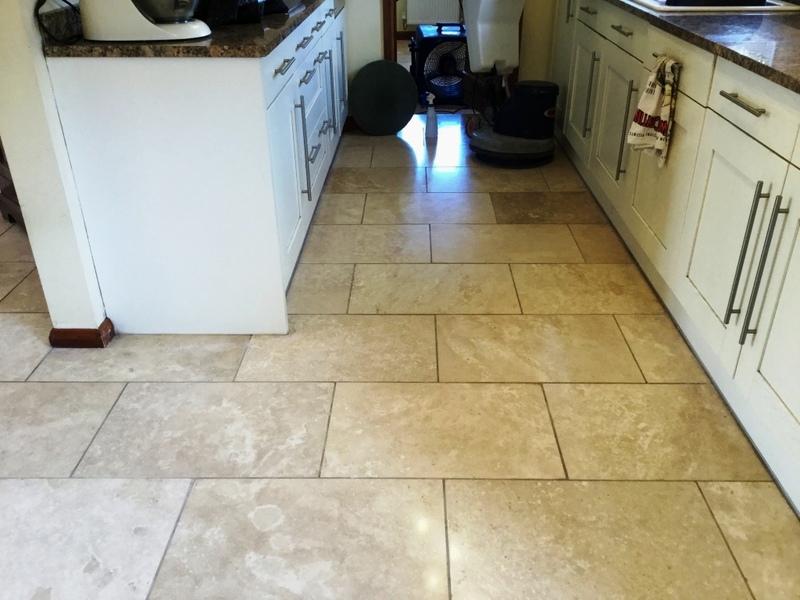 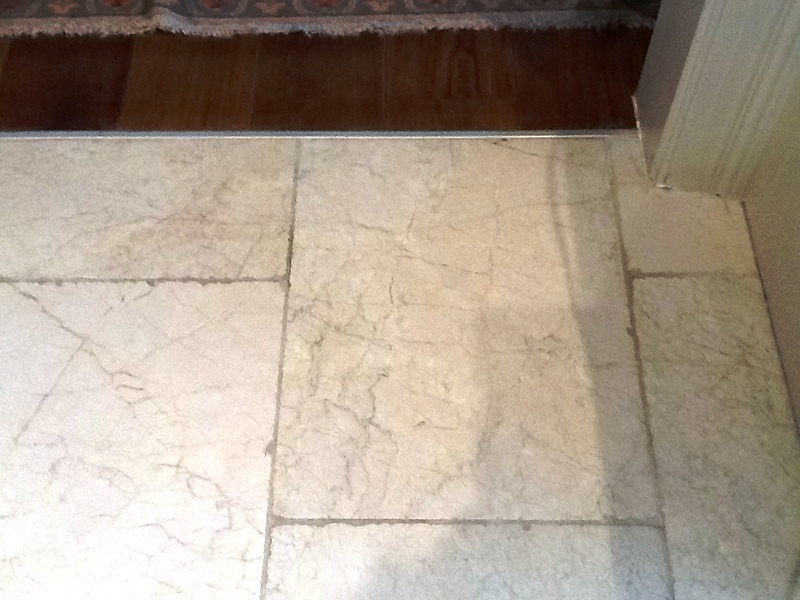 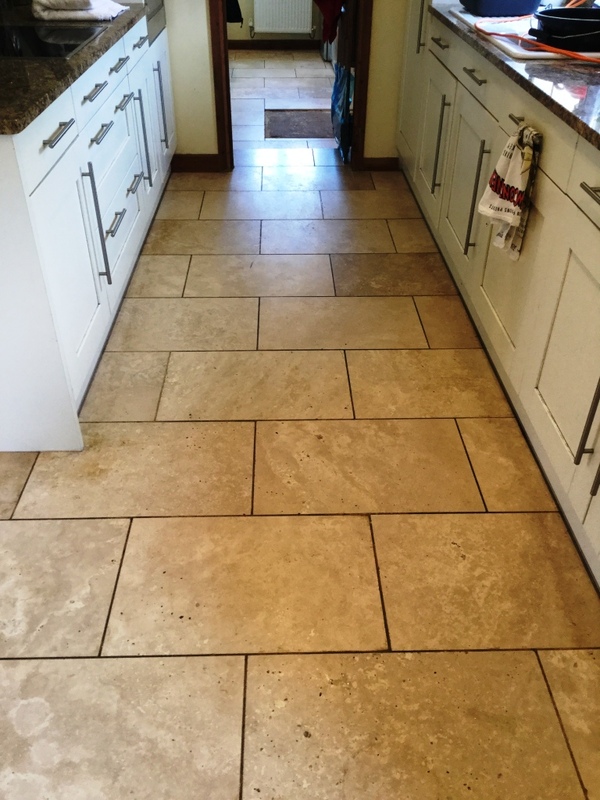 The floor had been installed in the kitchen and the lounge and both the slate and the grout was in need of a deep clean. 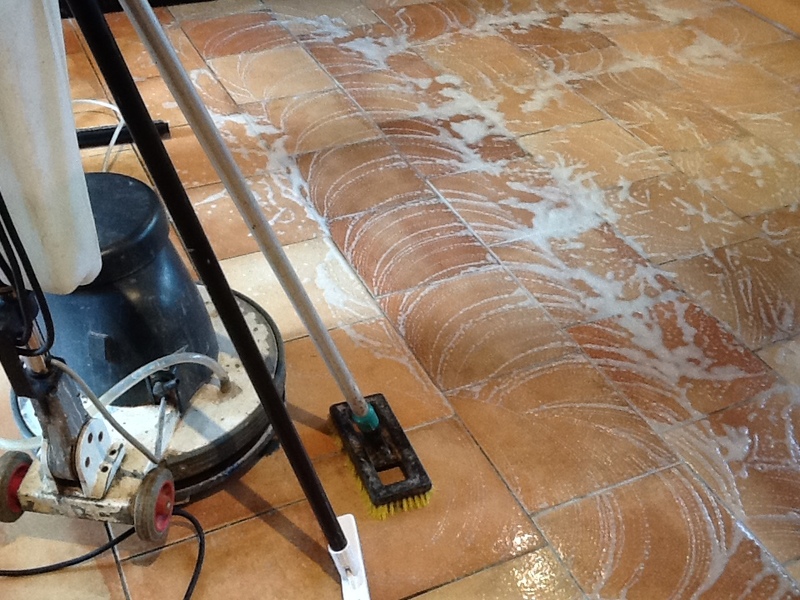 The first thing we do is to protect anything that can’t by moved by wrapping it in a plastic sheet once this was done we set about scrubbing the slate tiled floor with Tile Doctor Pro-Clean and a rotary machine fitted with a black pad, we used a grout brush to clean out the grout lines and then rinsed the floor thoroughly with clean water. 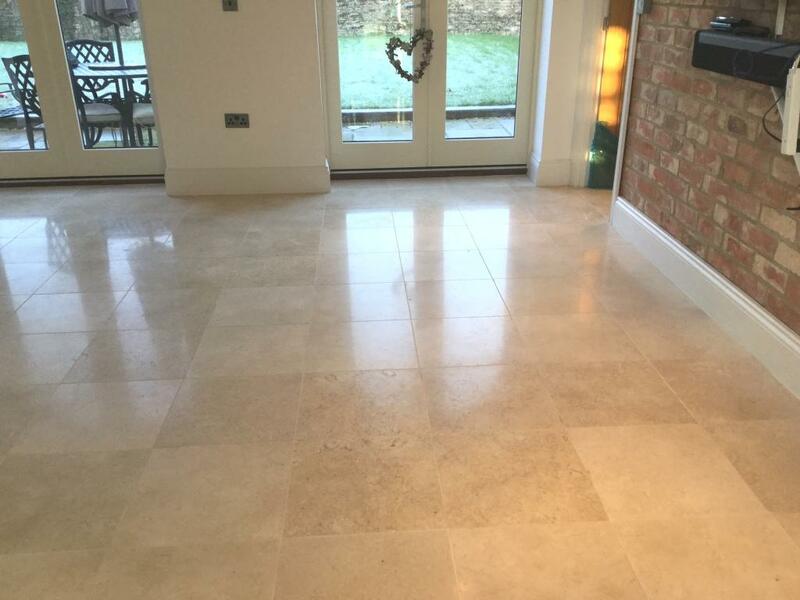 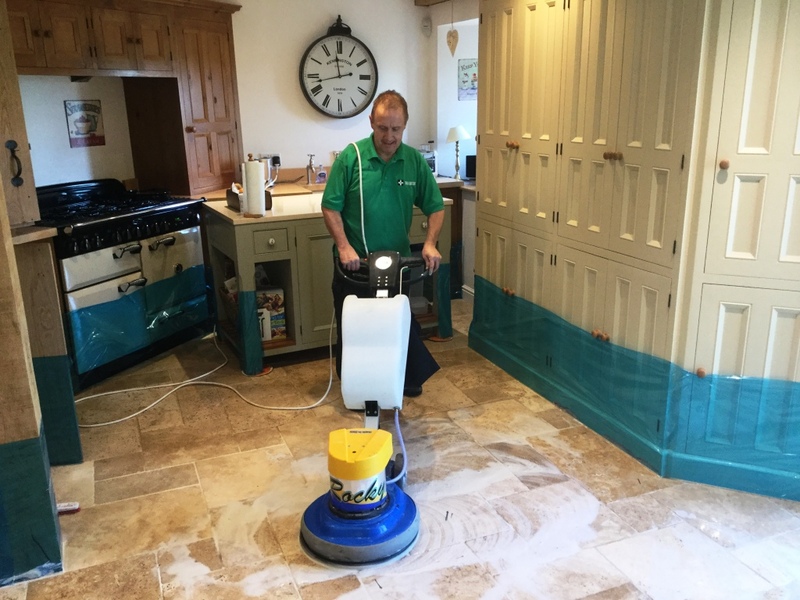 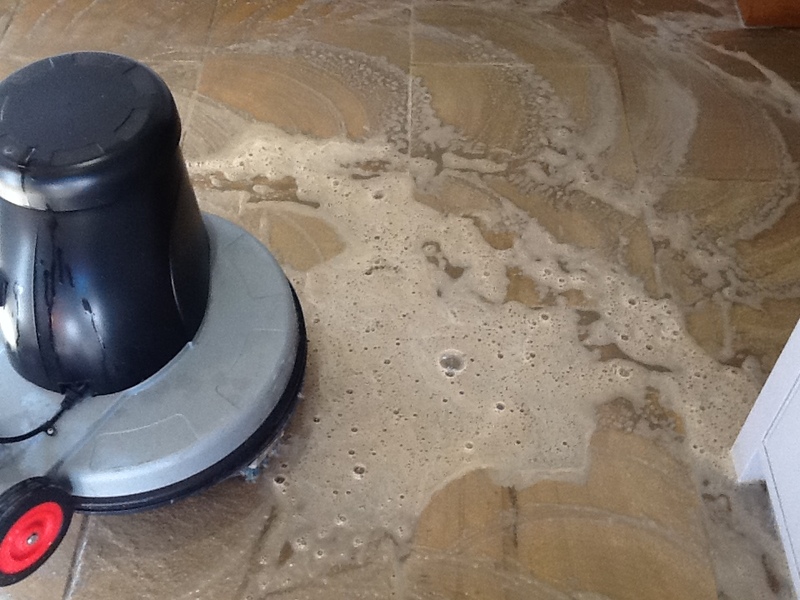 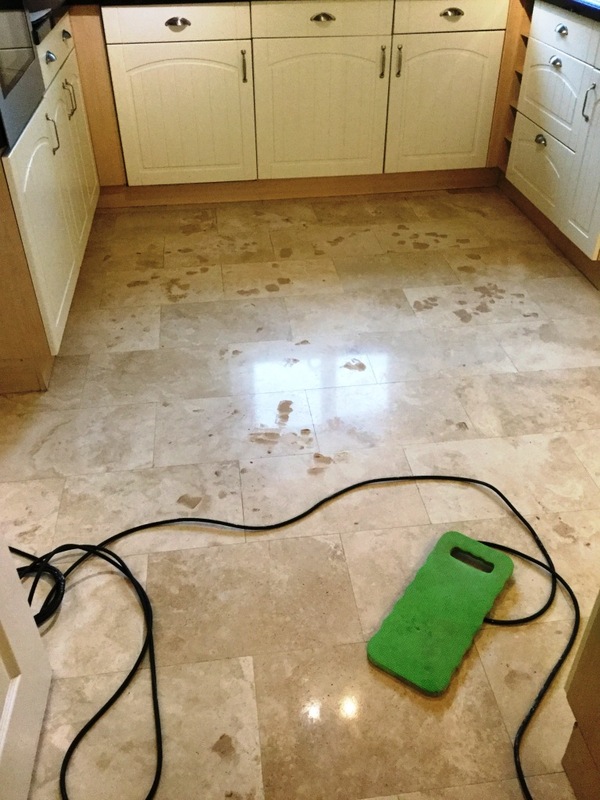 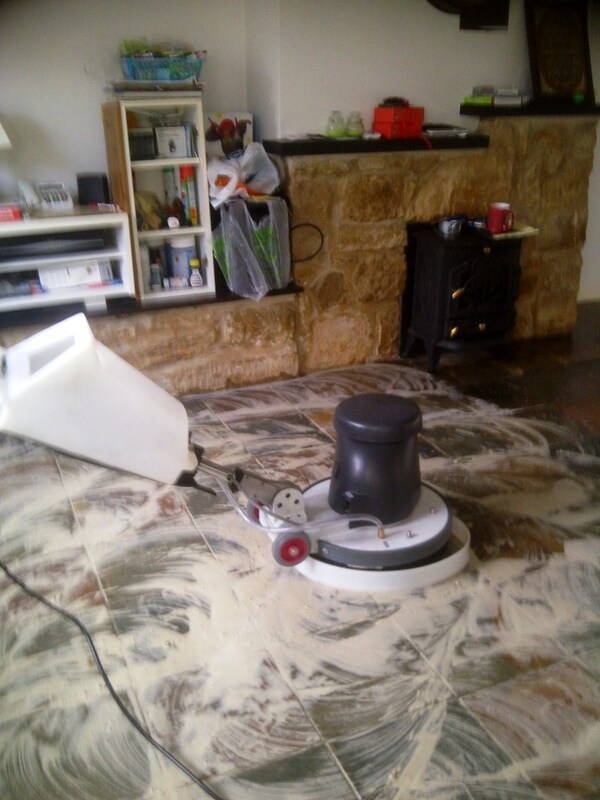 It’s not until the floor has been washed down that you can spot any stubborn or missed areas so it’s not usual to have to repeat this process until a satisfactory result is obtained. 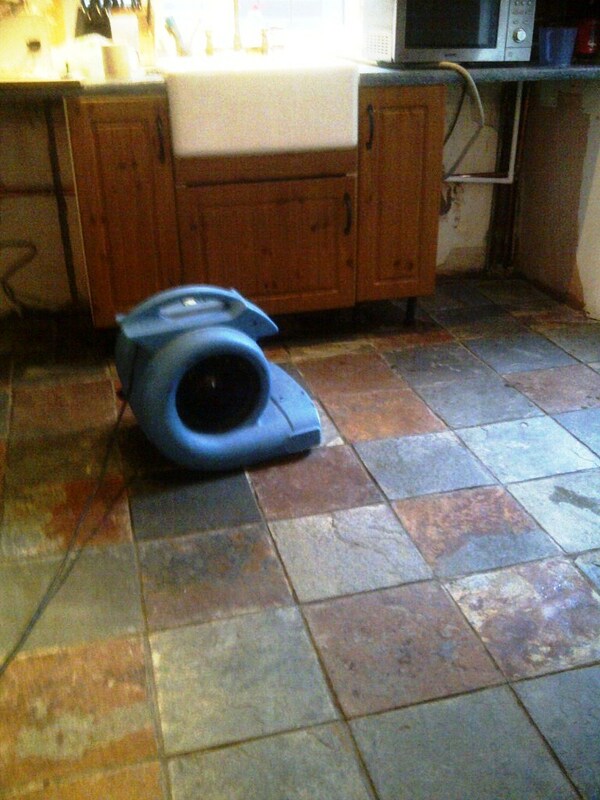 We had both the kitchen and lounge to do and this took most of the day, before leaving for the evening we switched on an air blower to help the floor to dry. 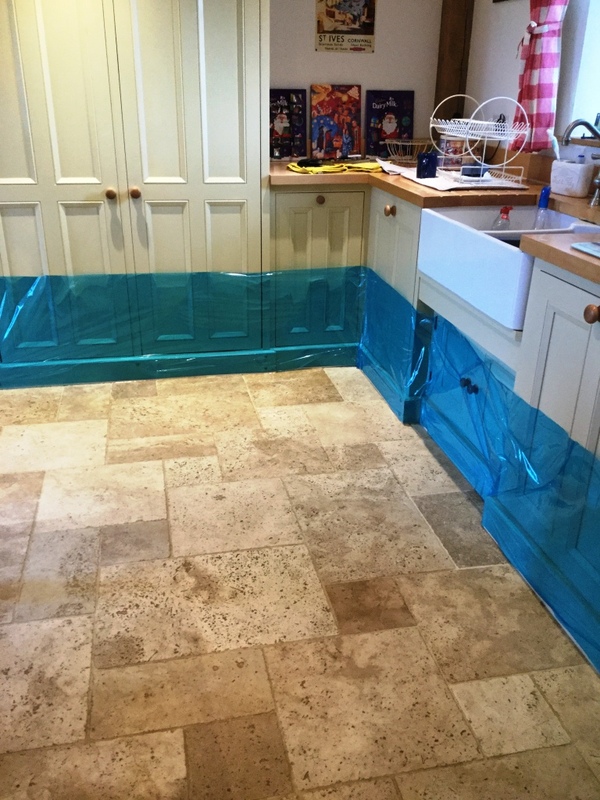 We came back the next day and checked the floor was dry, fortunately the air blower had done its job and we were able to get on with the sealing the floor. 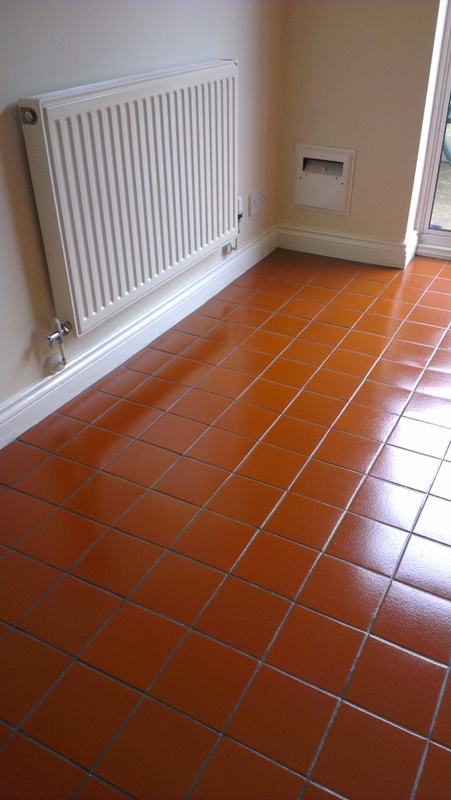 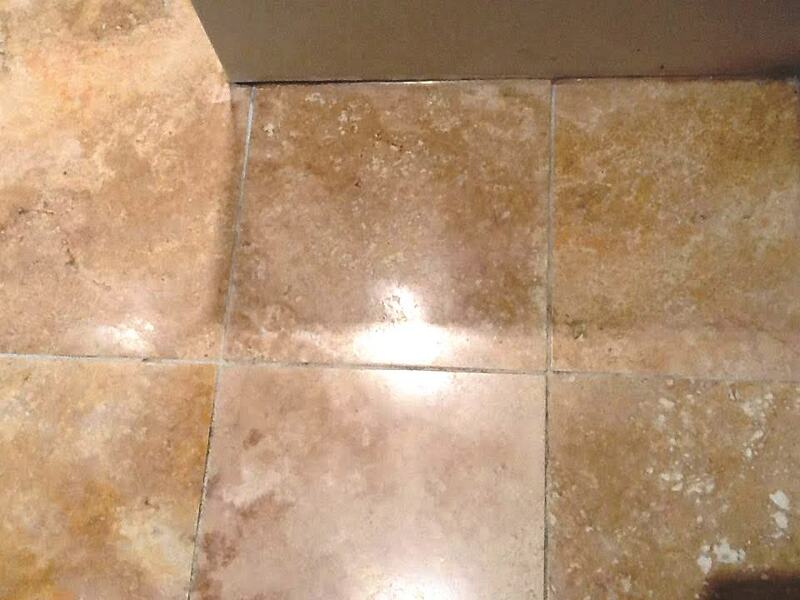 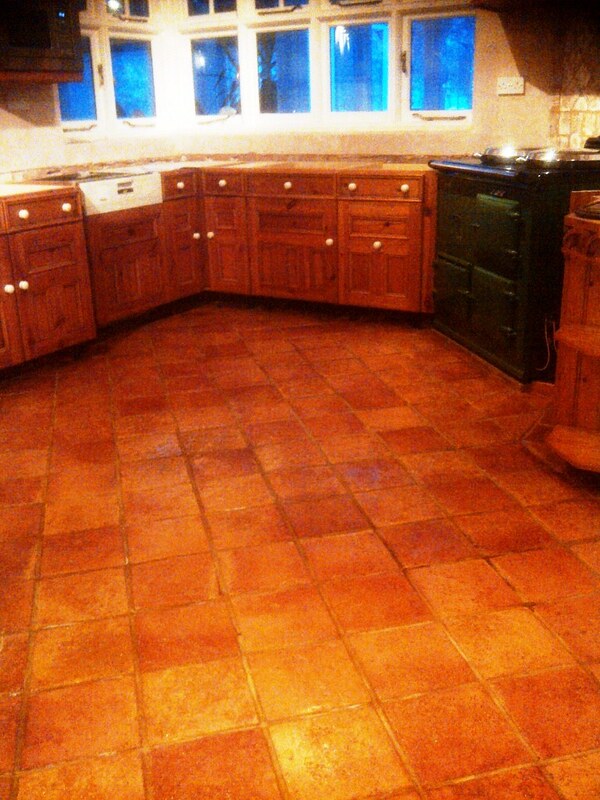 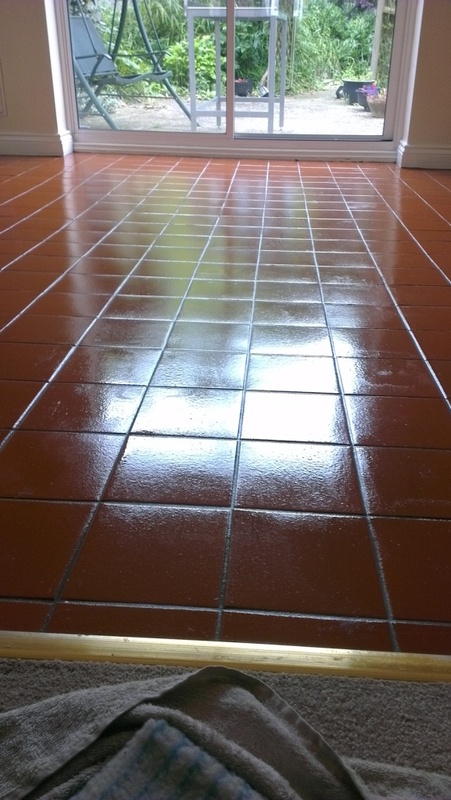 To seal the floor five coats of Tile Doctor Seal and Go were applied using a paint pad applicator. 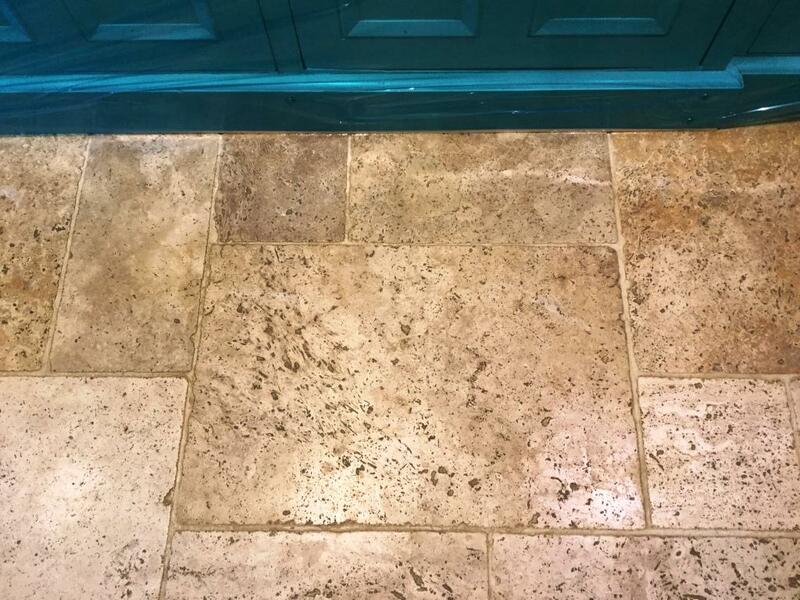 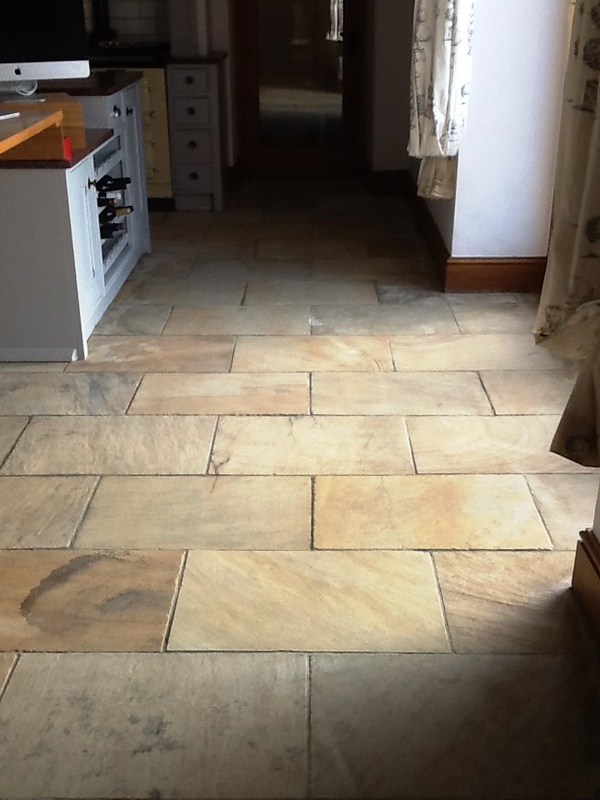 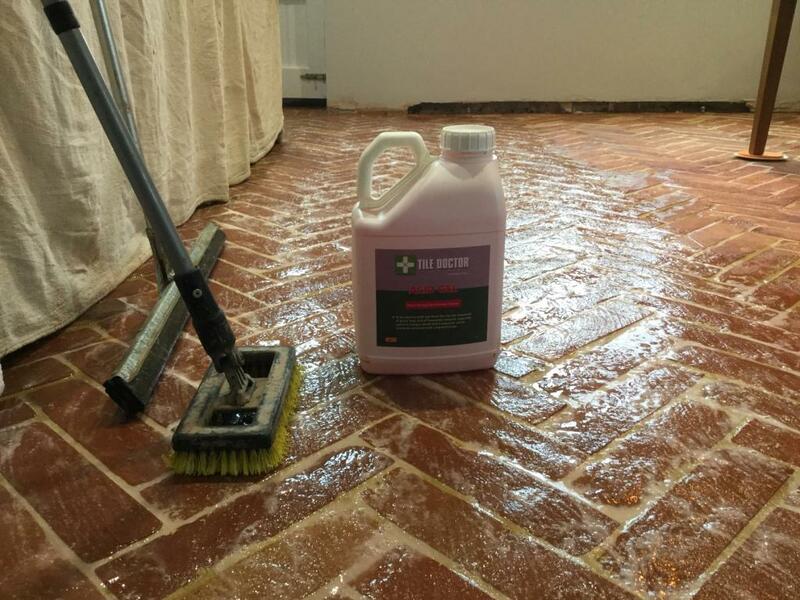 Seal and Go is recommended for Slate tiles and provides good stain protection with a low sheen finish that really does bring the floor alive. 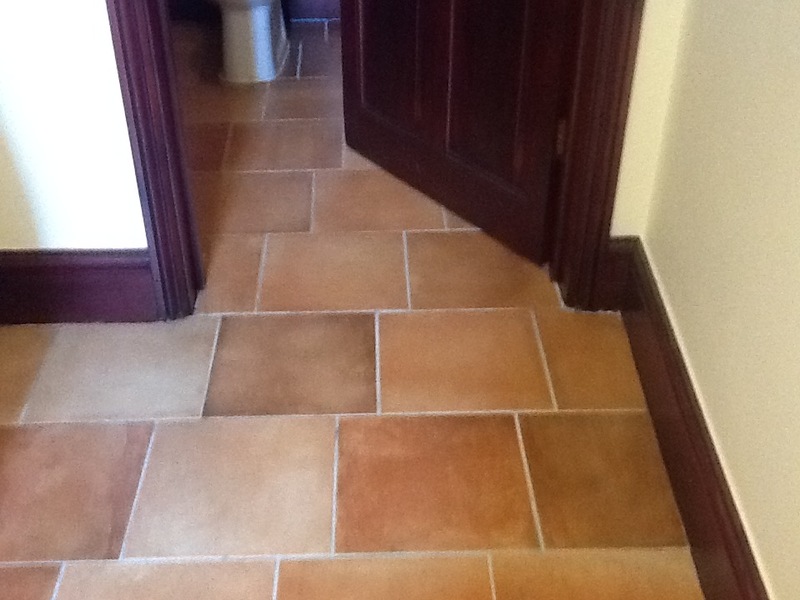 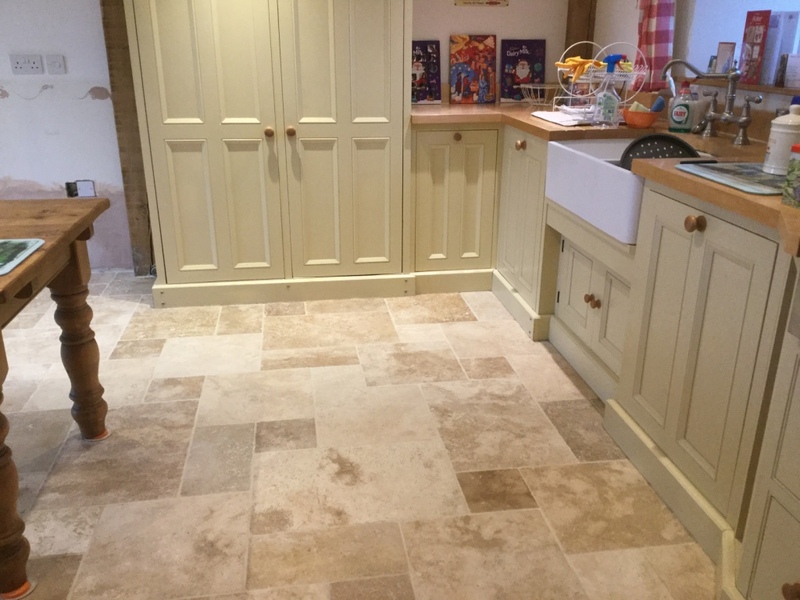 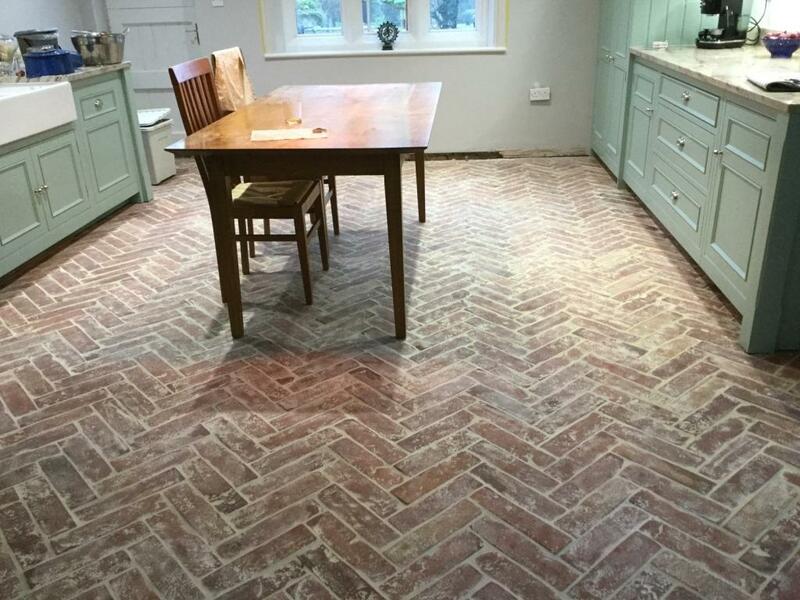 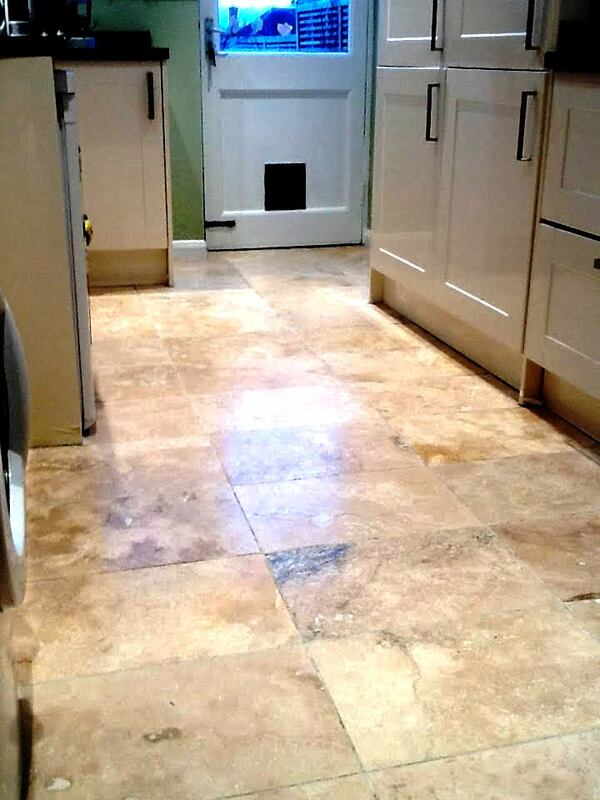 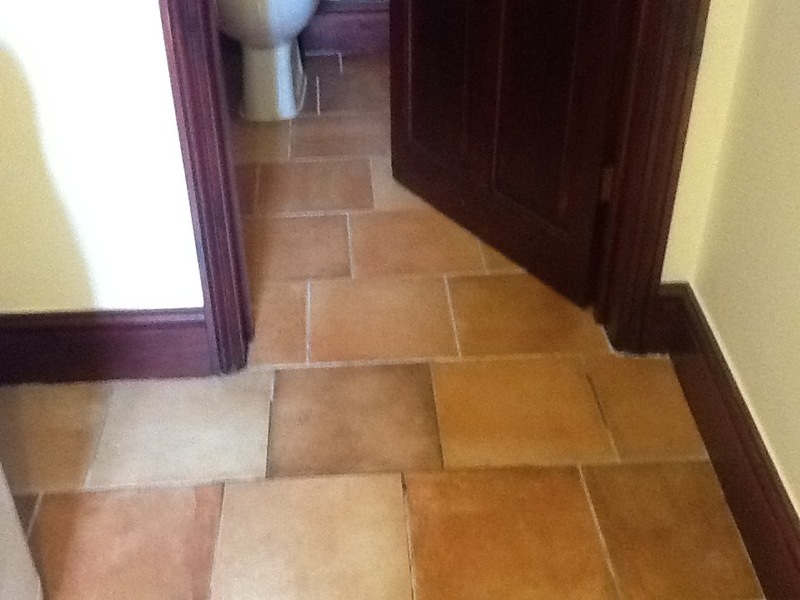 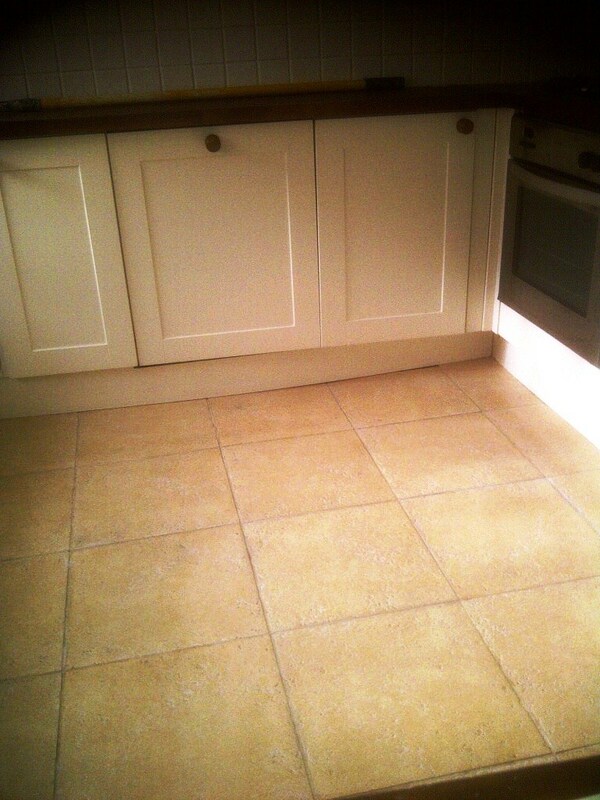 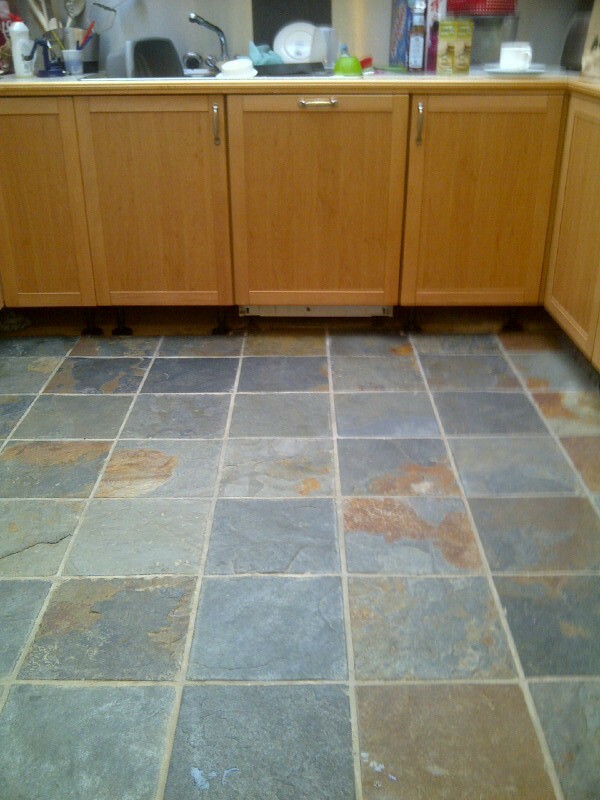 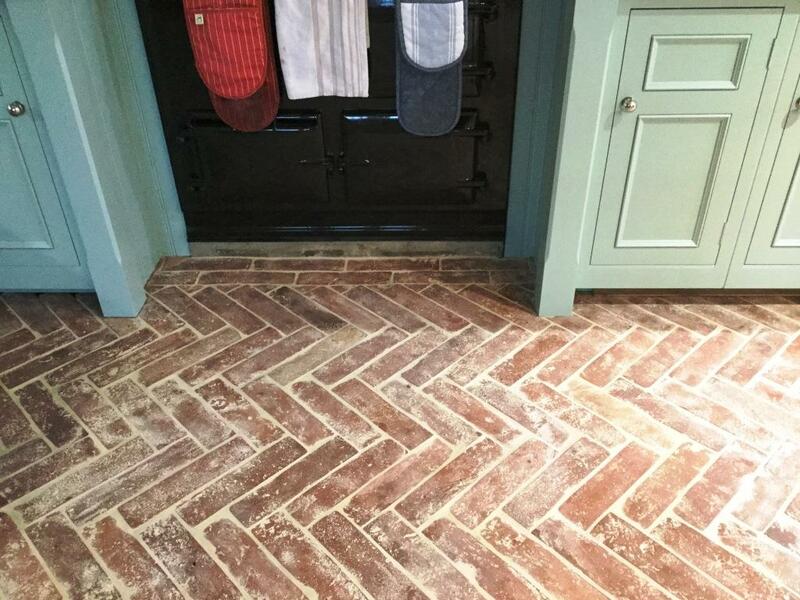 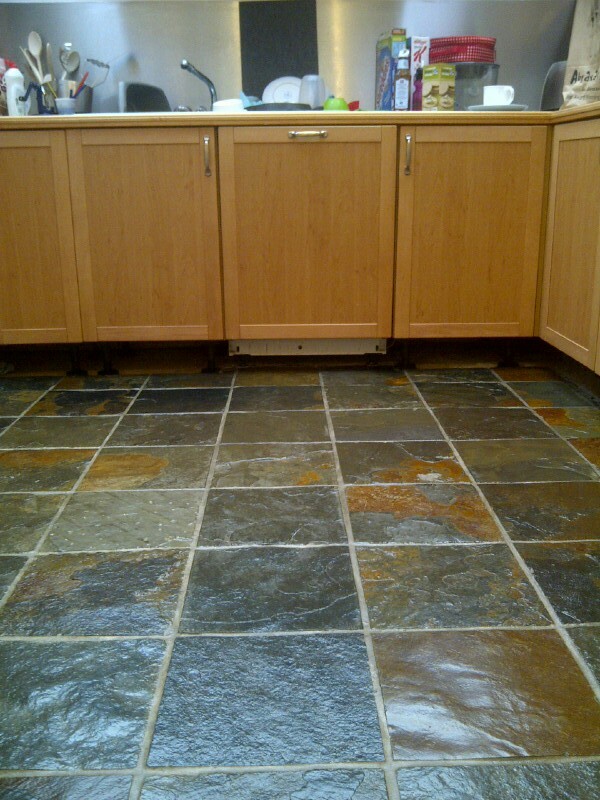 Pictures below from rough slate tile flooring installed in the Kitchen and Toilet of a house in Northampton. 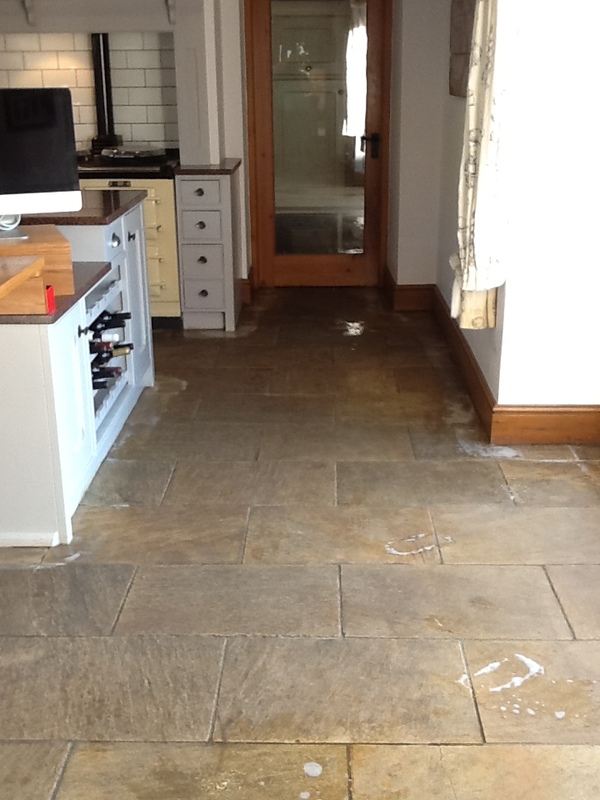 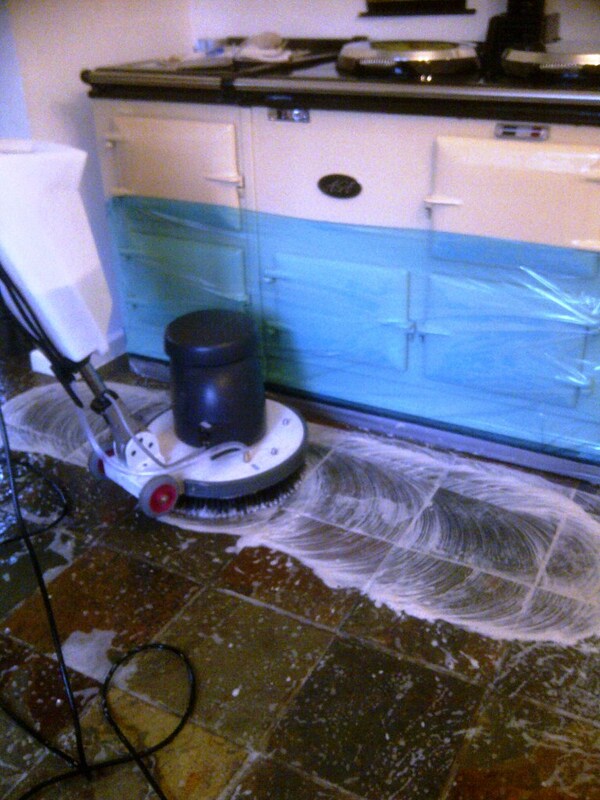 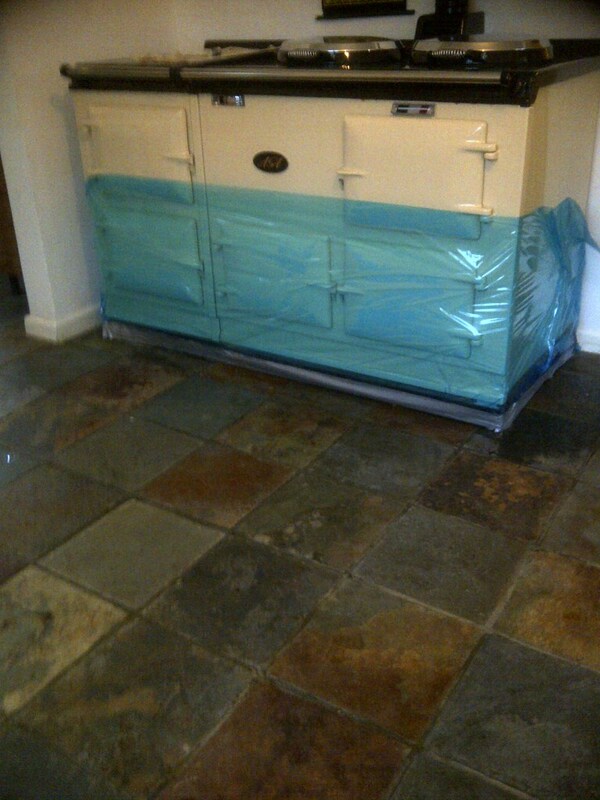 The home owner had called us in to give the slate floor a clean and seal. 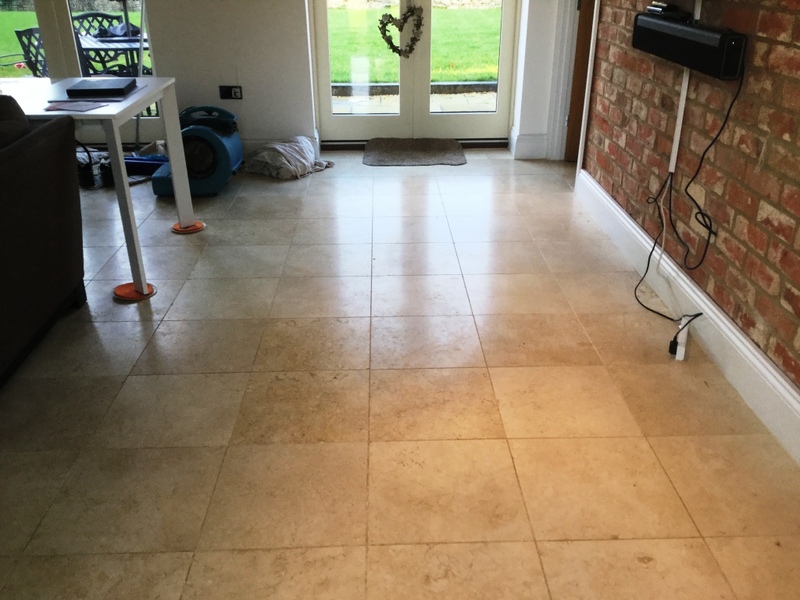 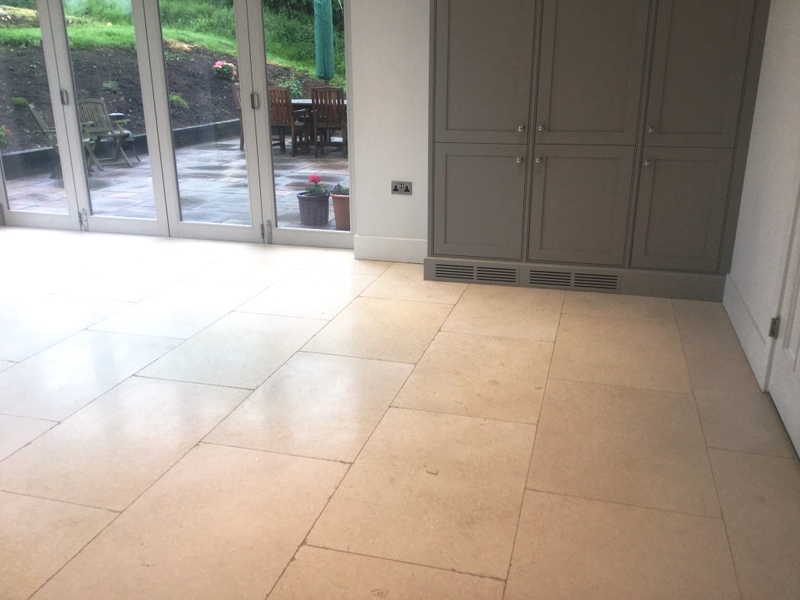 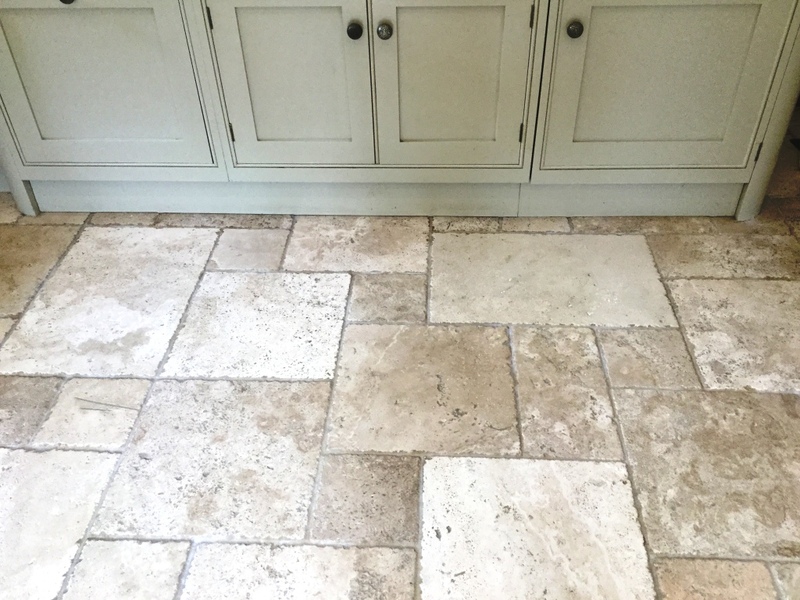 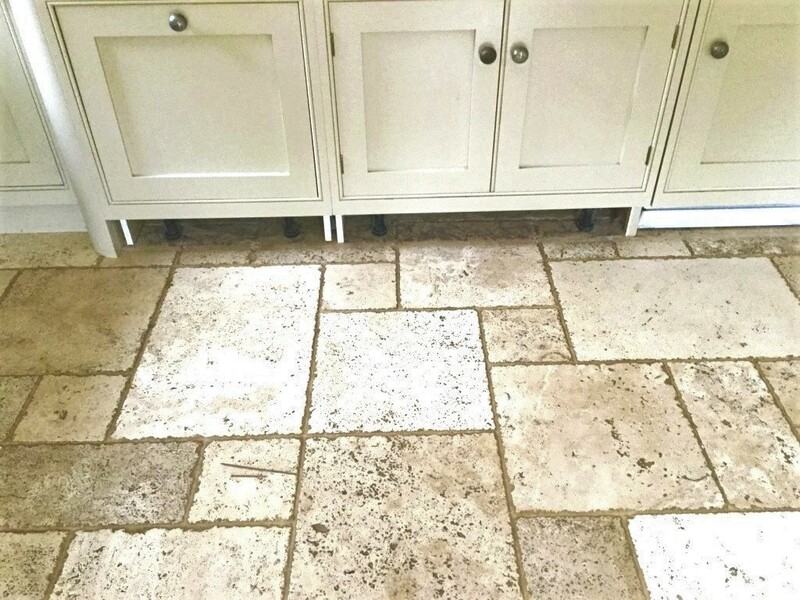 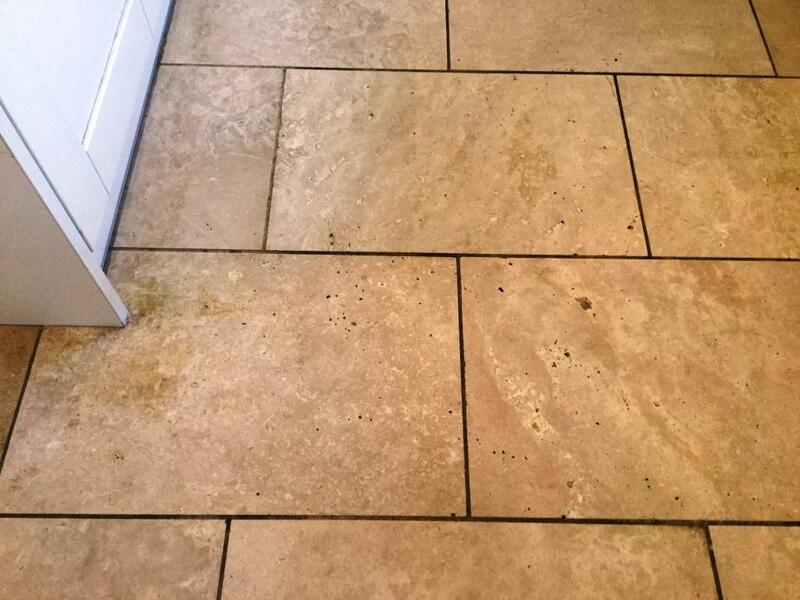 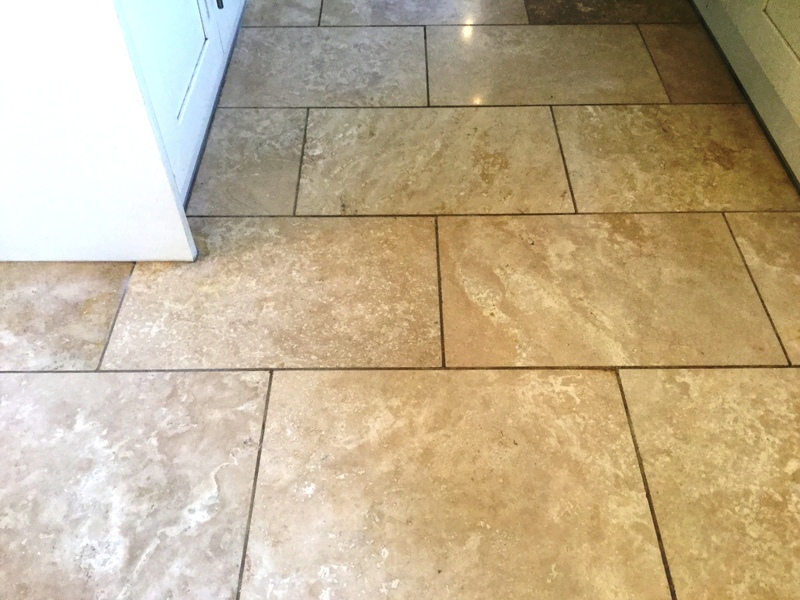 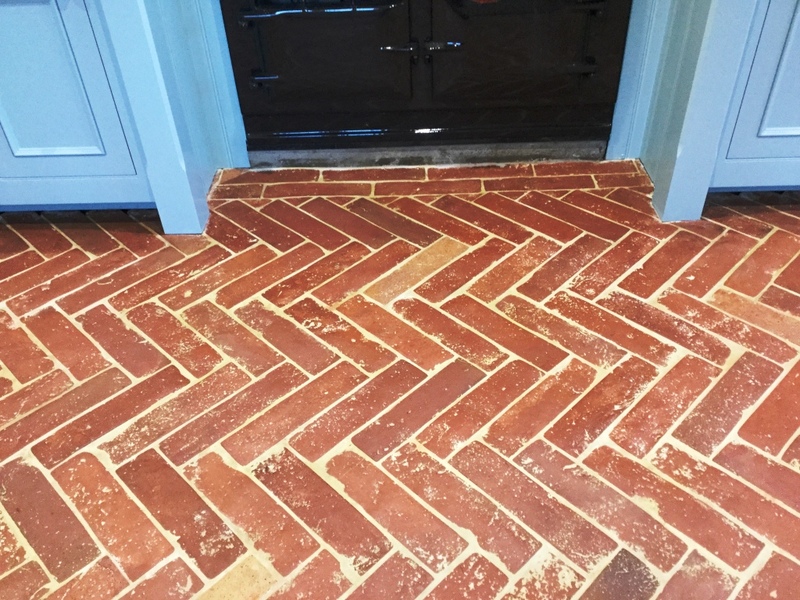 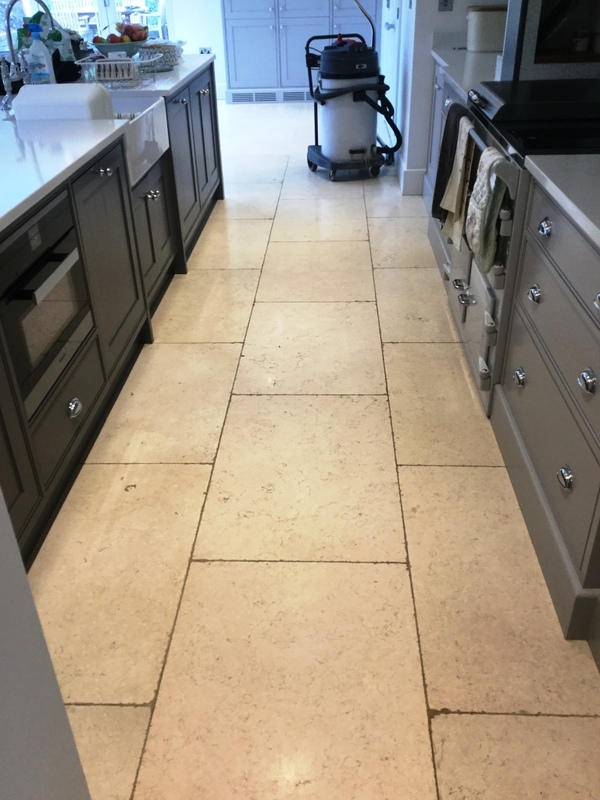 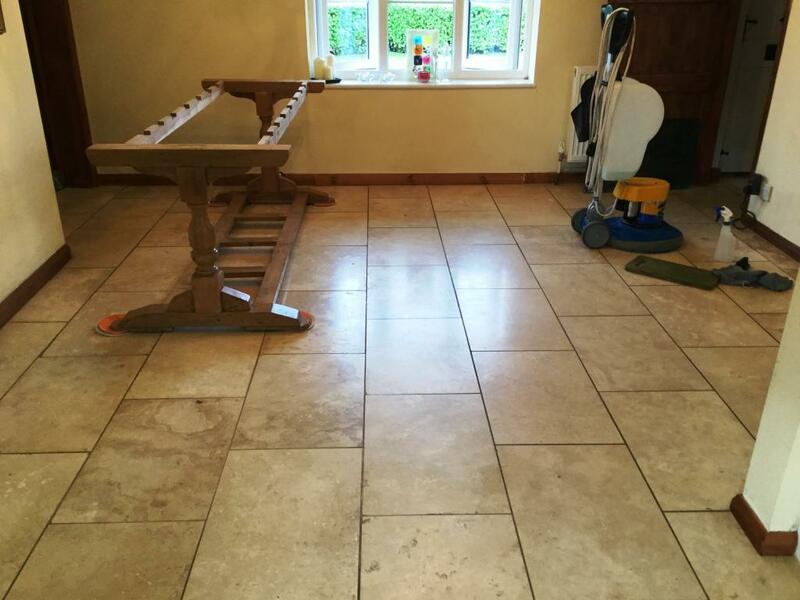 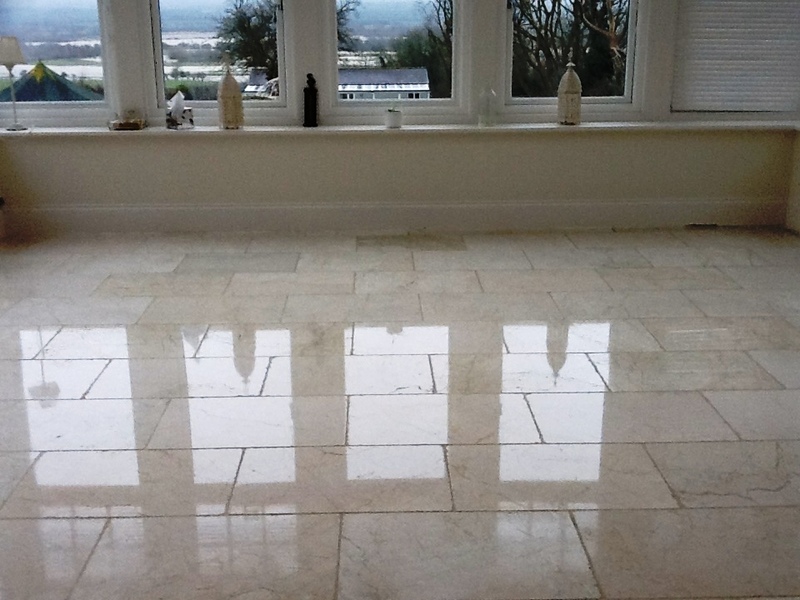 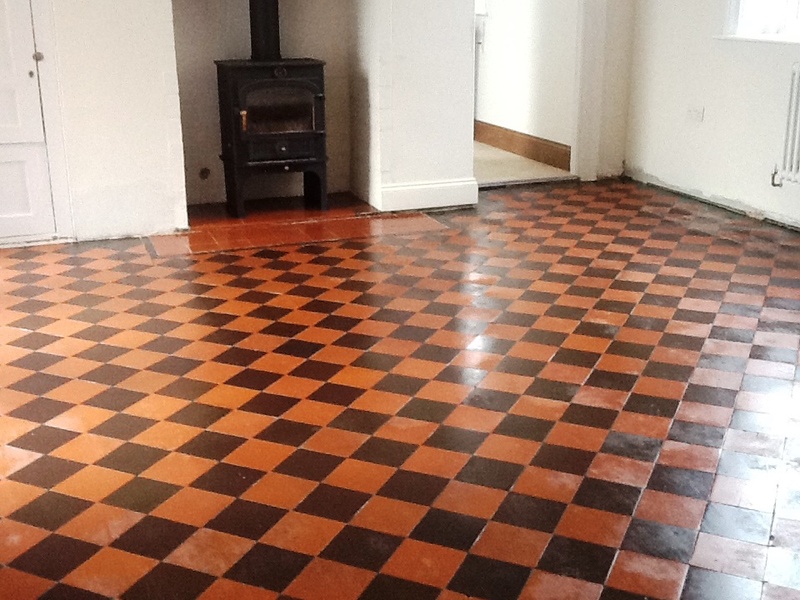 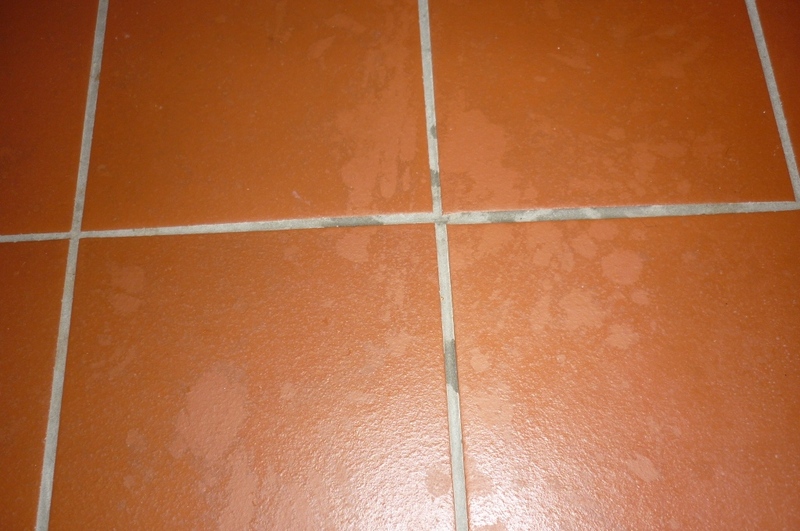 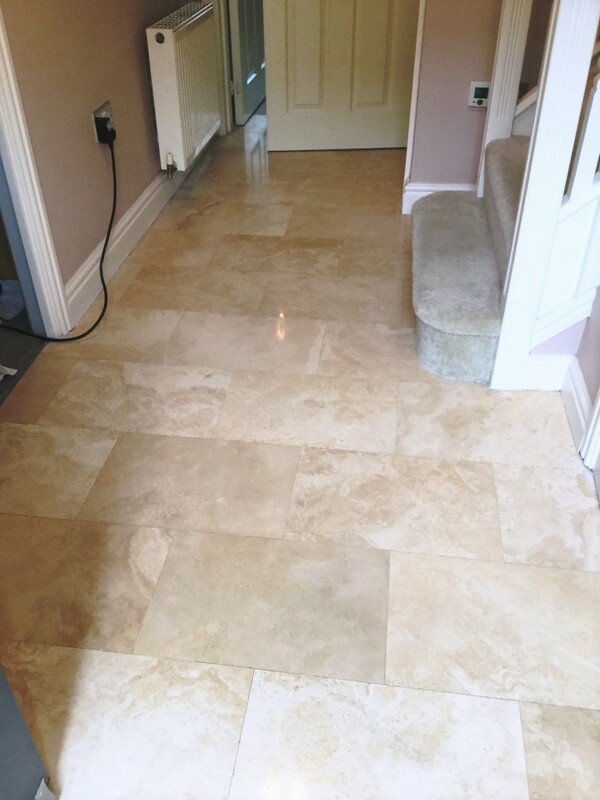 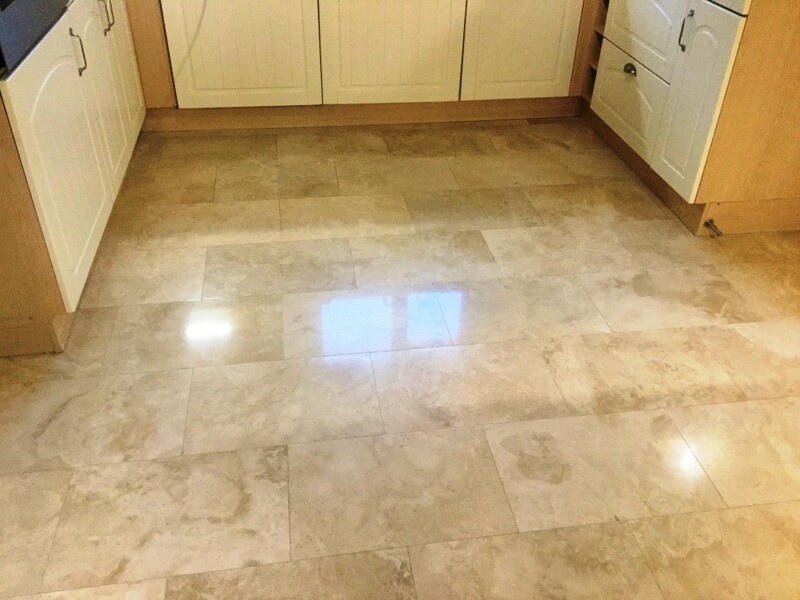 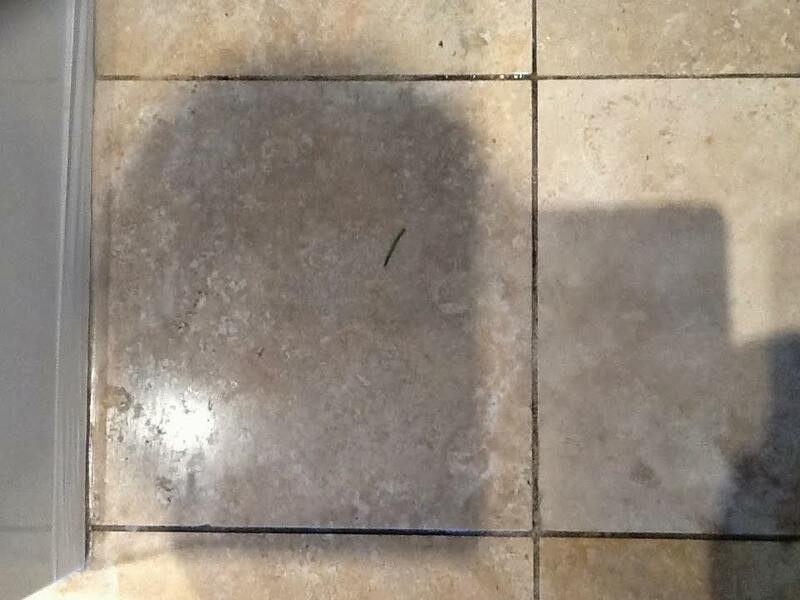 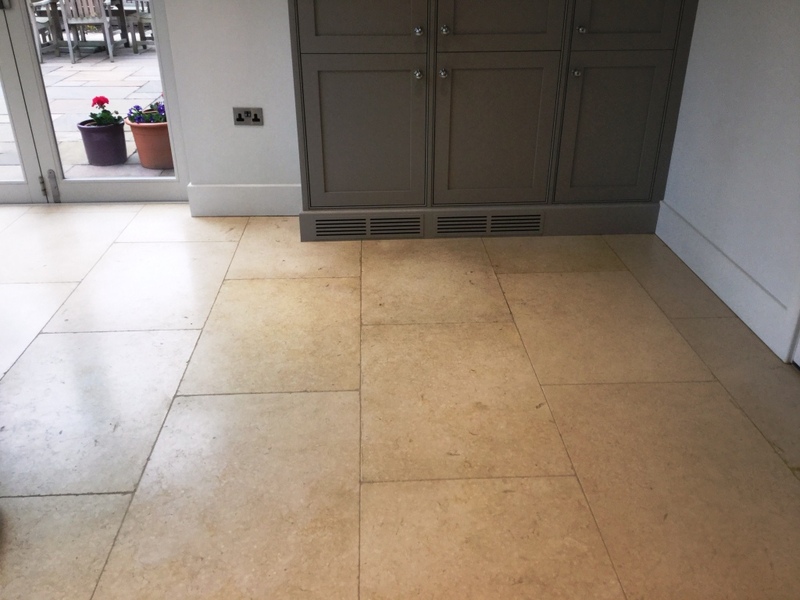 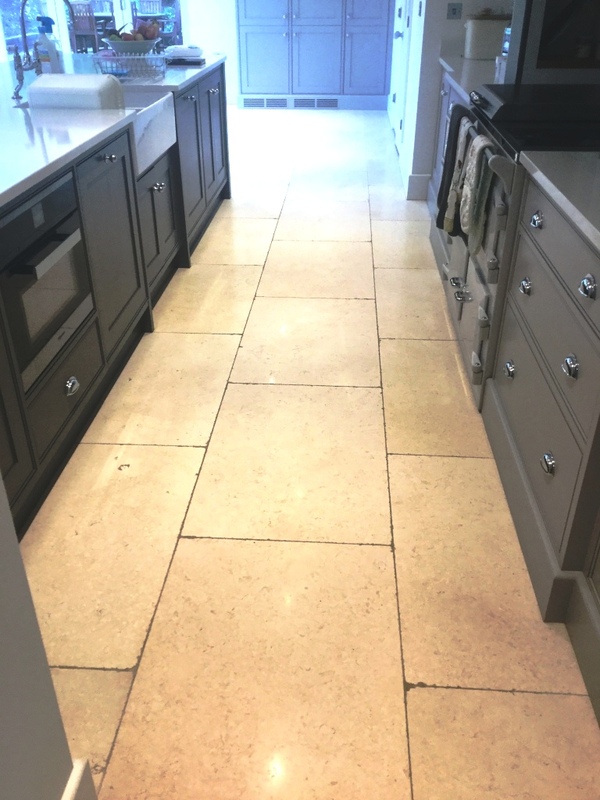 We cleaned the slate tiled floor with a strong dilution of Tile Doctor Pro-Clean in order to strip any remaining sealer together with a buffing machine fitted with a black scrubbing pad. 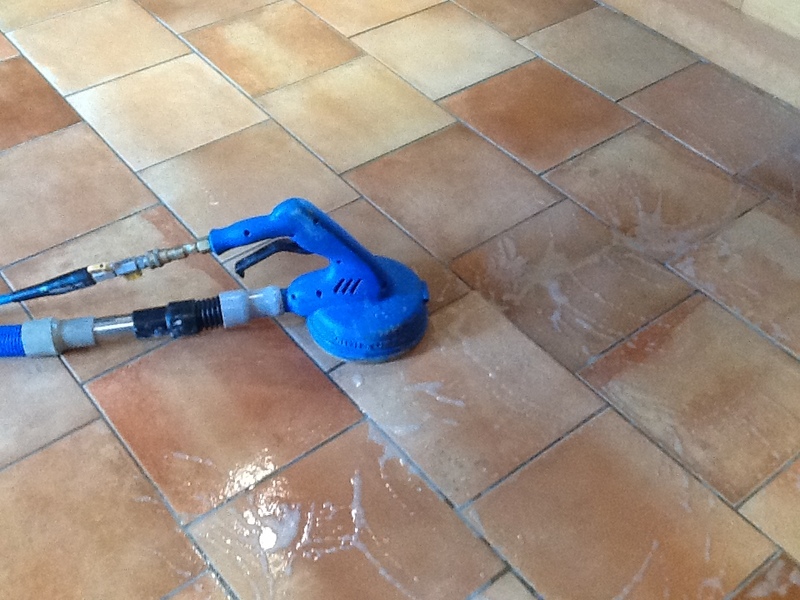 The buffing machine doesn’t get into the grout lines so well so we had to use hand brushes for that. 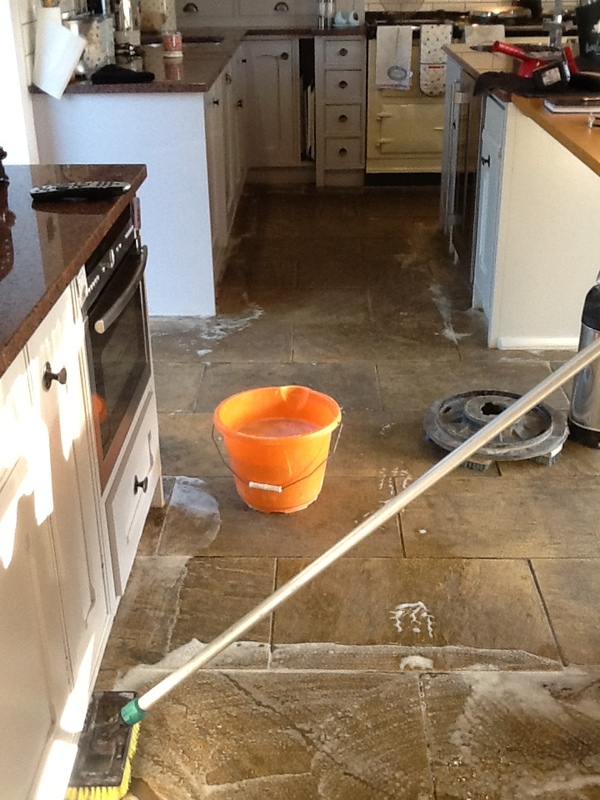 The floor was washed down with clean water and then left to dry overnight. 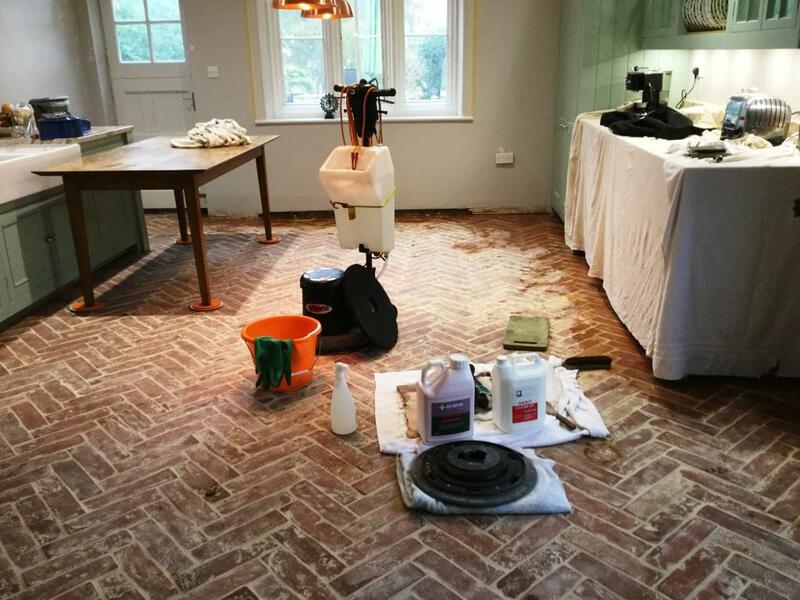 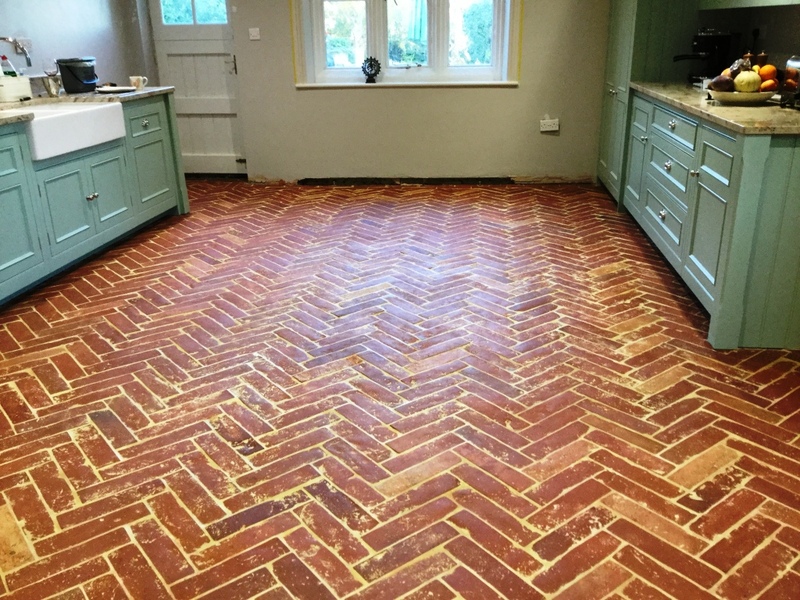 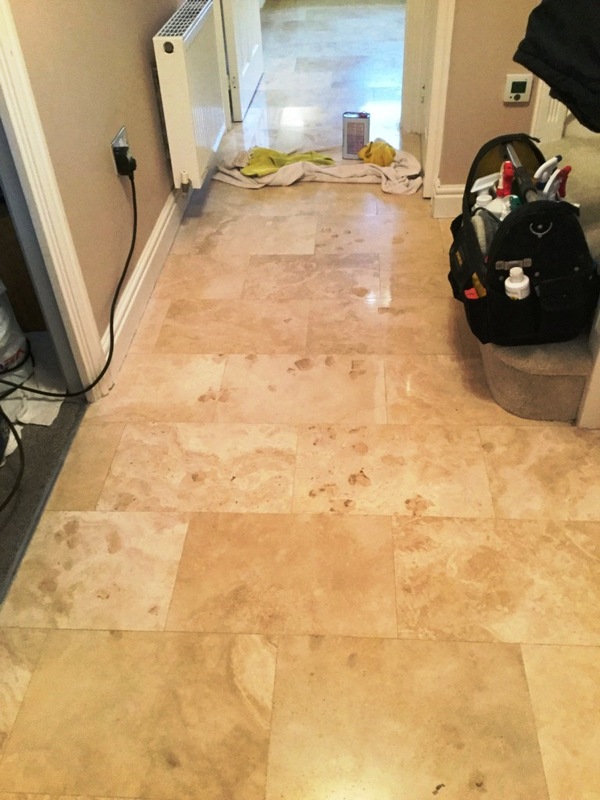 We came back the next day to seal the floor using five coats Tile Doctor Seal and Go which provides stain resistance as well as adding a low sheen to the floor. 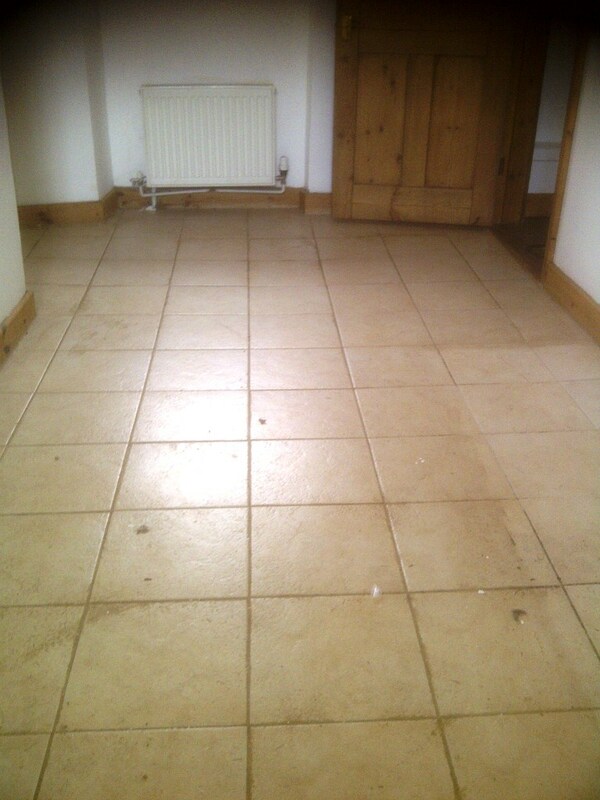 The home owner was very happy with work we did and left the comment below. 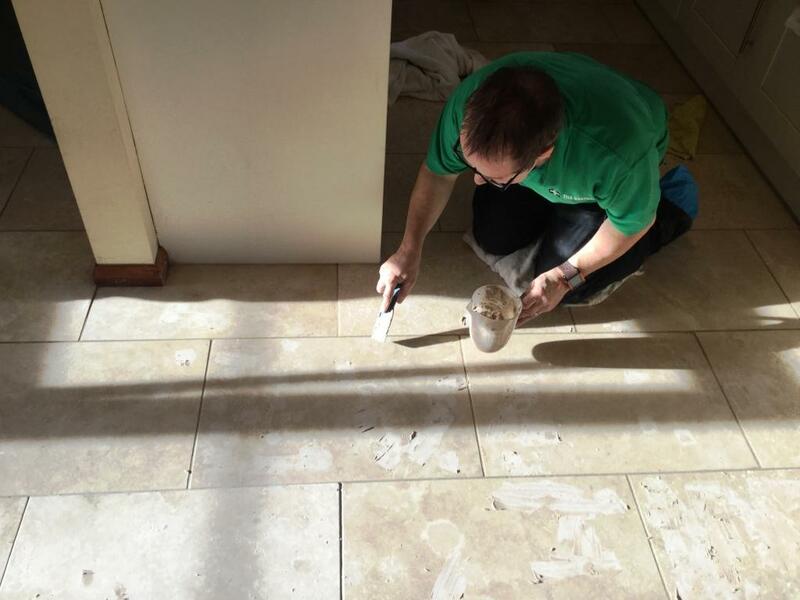 Effective and efficient service, would highly recommend Phil Vissian and the service provided.